and PRINTED ADVERTS on Cards and Envelopes. 152140. A small collection of the GLASGOW CARLISLE SORTING TENDER duplex used on very fine postcards. 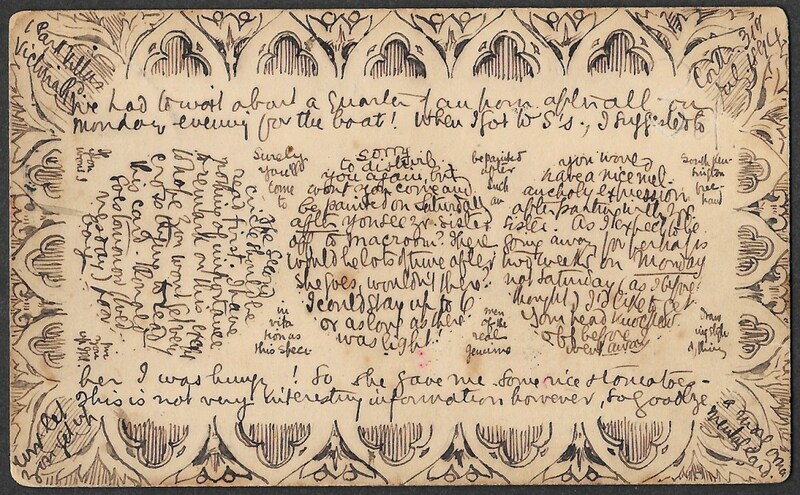 The FIRST: June 10th 1872 on the first type of 1/2d postcard. This is Figure 730 in the Railway Philatelic Group (RPG) publication. It is the first type of 'UP' cancellation. From January 1st 1872 numbers 1 and 2 were used on alternate nights. 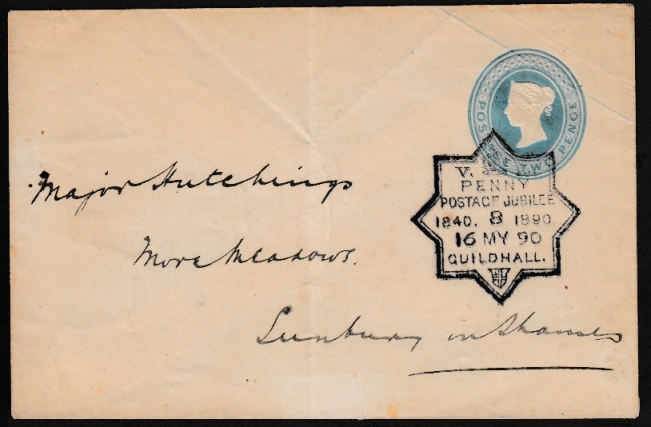 A very scarce cancellation and especially so with such a fine strike. The SECOND: August 29th 1879 on a 1/2d UPU postcard, Figure 731 in the RPG Publication. An example from the second series of the 'UP' duplex. 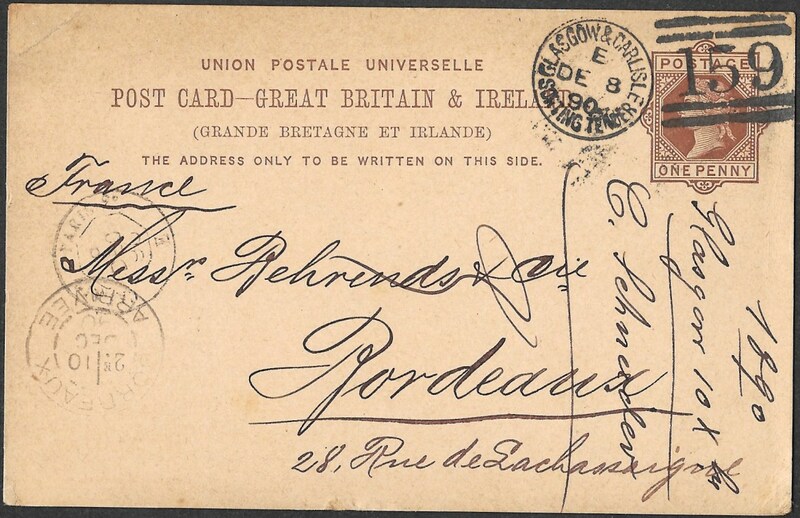 The THIRD: December 8th 1890 on a UPU postcard with '& Ireland' added, Figure 738 in the RPG Publication. This is a rare/very rare cancellation and appears to have been infrequently used. The bars in the duplex appear to be breaking up. An attractive grouping that would display well. NB: the reverse side of each postcard has either a printed or hand written message. 152134. 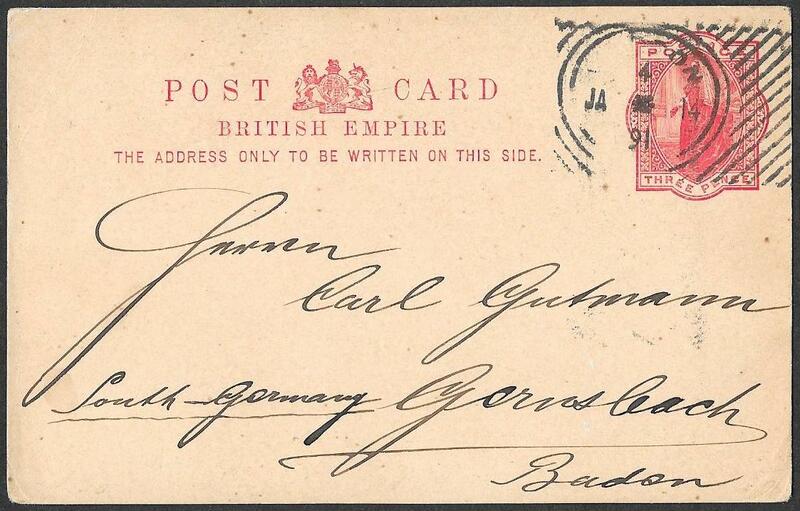 1/2d postcard from Cork to Passage West, August 1st 1894. 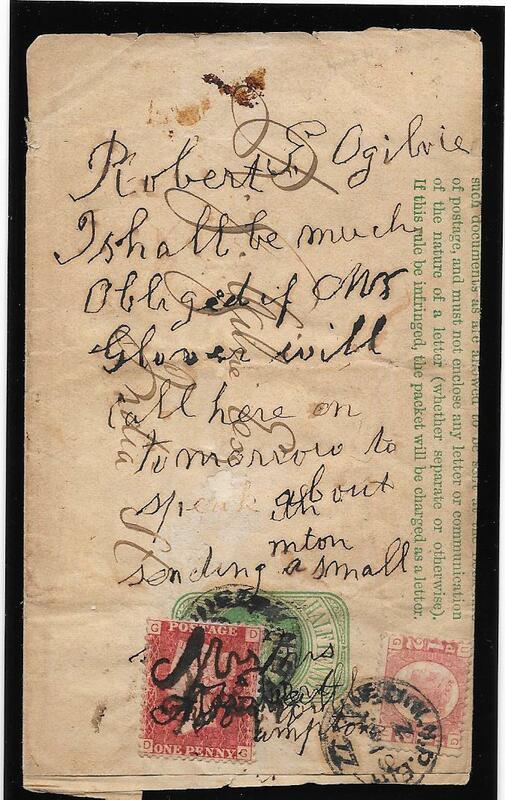 On the reverse is a remarkable hand drawn message the like of which we have never previously seen. One wonders how long it took the artist to complete this with such accuracy? 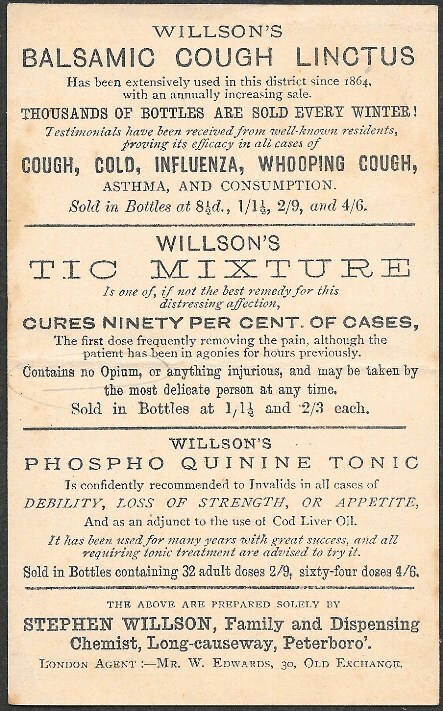 with a very interesting range of adverts from Wilson's Chemists in Peterborough. Vertical crease but not as pronounced on the reverse so displays well. 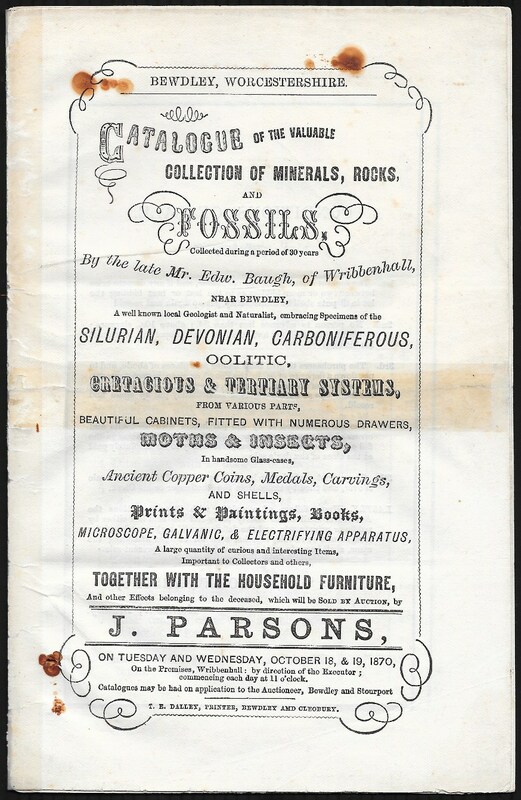 1/2d SG 48 Plate 1,very fine, tied to an Auction Cataloge of FOSSILS and other Collectables by a BEWDLEY cds for October 13th 1870. 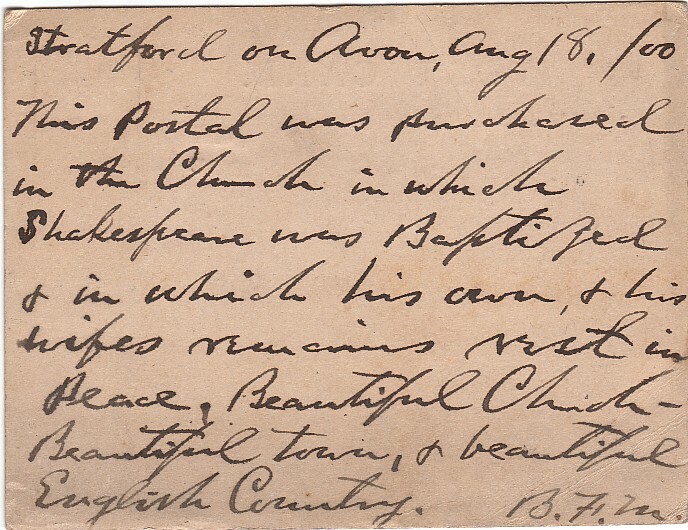 Addressed to Shifnal with Sheffield cds for October 14th 1870 and a Shifnal receiving cds for October 15th 1870. The 16 page Catalogue has been carefully repaired. Plate 1 is a scarce plate to find on cover, priced by Gibbons at £230 before the premium for cds is added. and the first as such we have seen. and the earliest we have seen on an auction catalogue! 152126. Printed buff Registered Envelope from London to BEDALE. was paid by a 1d red imperf, alphabet 1, not full margined, but a rare usage. Cancelled by an indistinct Bishopgate St Without EC cds: the month of May is visible but not the year. 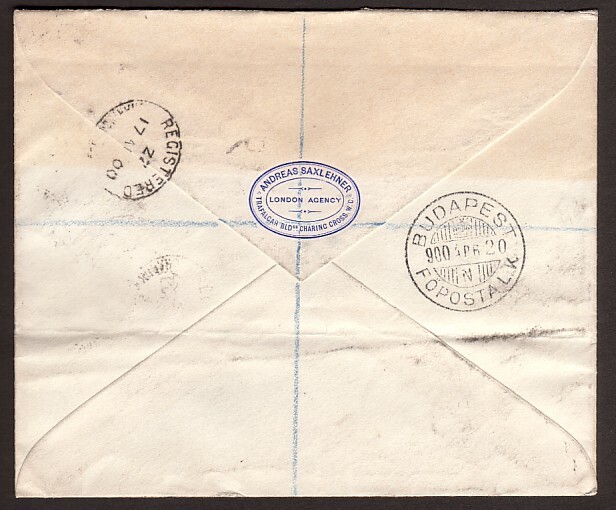 However, this type of Stationery Envelope, RP22, was issued in 1898. The 1d red was placed across the flap as added security for the contents. 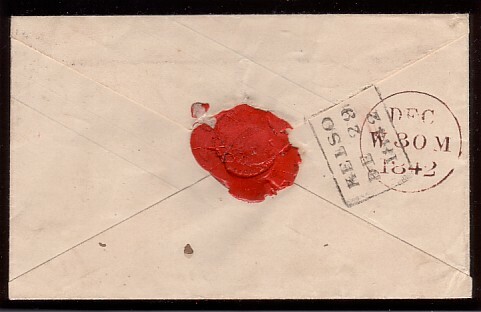 An extremely late usage of this 1d red and the latest we have seen on a registered envelope. there are NO age spots on the scallopped flaps. The reverse side also is much finer than the scan. 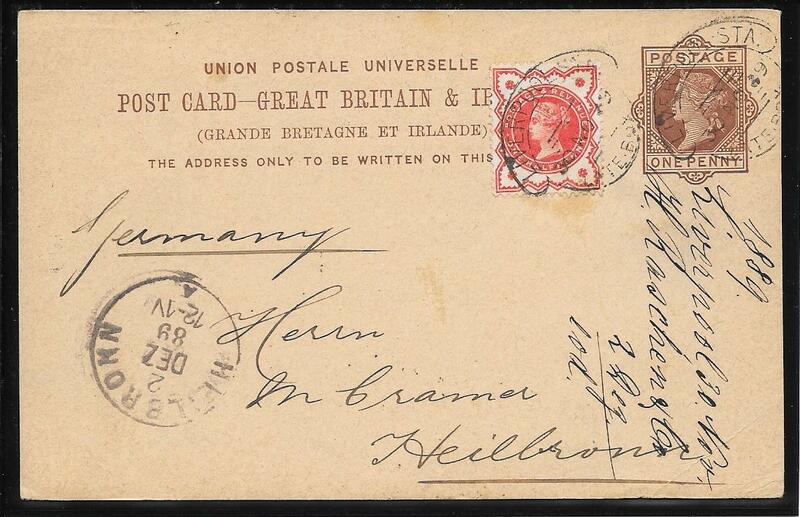 The very scarce G size printed Registered Envelope sent from Liverpool to Berlin, August 10th 1878. 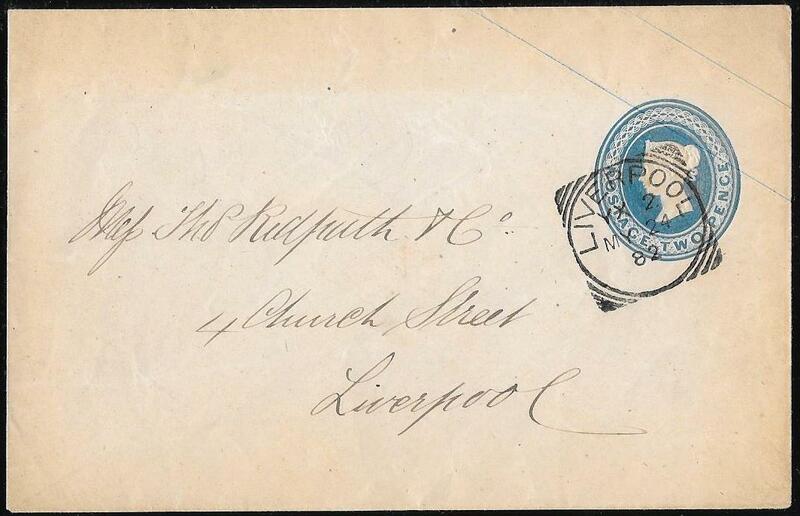 Franked with a 3d SG144 Plate 19 and a 2d SG47 Plate 15, 'AI' and tied by the '466' of Liverpool. The printing dates were only between 5-3-78 and 18-3-78: this envelope from the second day of printing, 6-3-78. The G size is much scarcer than the F size envelope which was printed between 6-2-78 and 13-3-78. 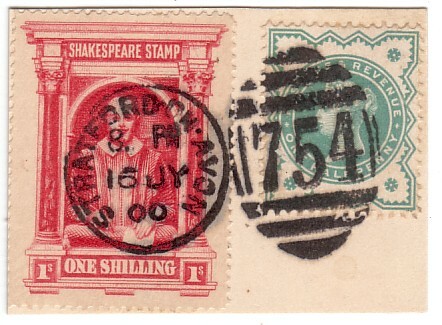 Both stamps are perfinned B B &Co with the first B reversed. 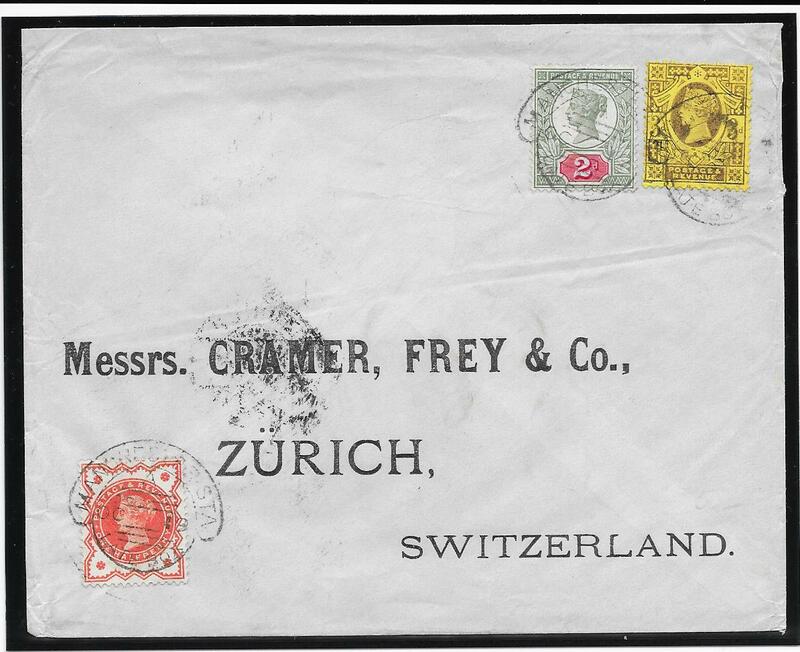 On the front of the envelope, bottom left, is the name of the sender: BLESSIG BRAUN & Co hence the perfinned lettering. to differentiate their name from Baker, Baker & Co.
it which would make an interesting display item. NB: We believe the identity of this perfin has not previously been confirmed. 152123. 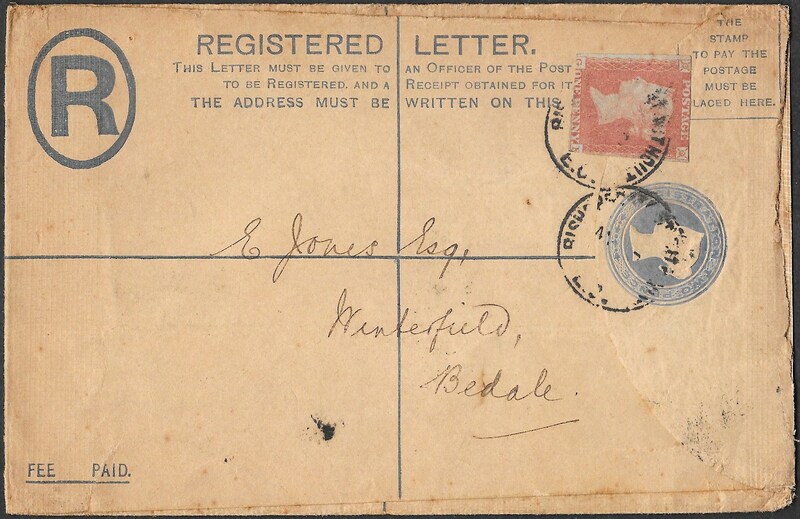 A 'G' size printed Registered Envelope from Manchester to Salonica, May 29th 1884; part of the rear flap is missing. Franked by a 5d indigo, SG169, some light creasing at the right, and a twopence halfpenny, SG190. 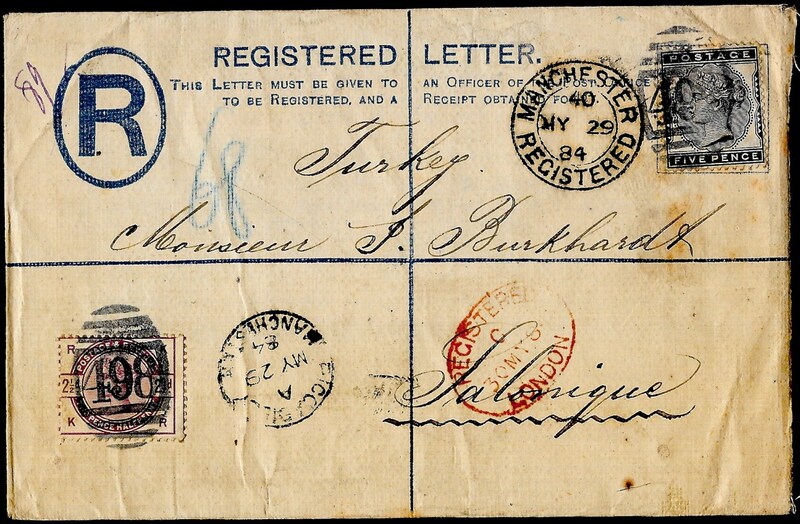 Manchester Registered upright date stamp on the front. There are no date markings on the reverse. 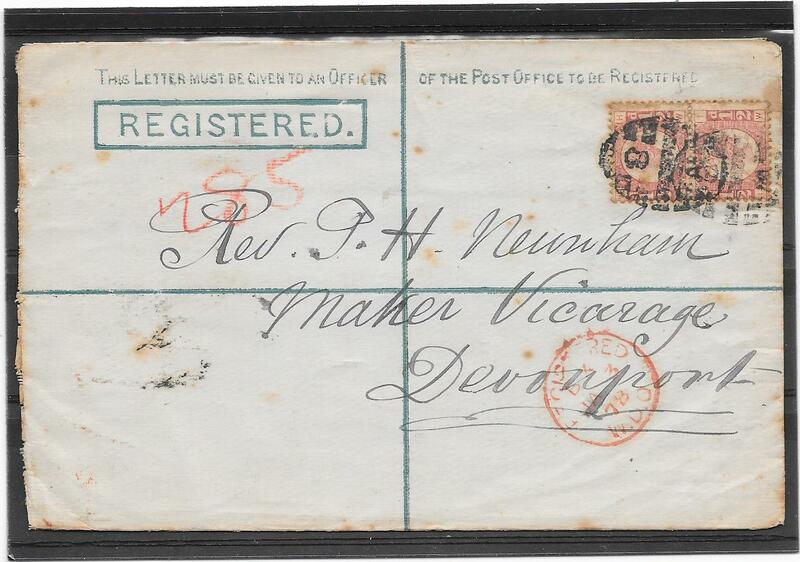 We have seldom seen this 5d on a registered envelope which is priced by Gibbons at £325 on a non-registered cover. A scarce and attractive item. 151949. 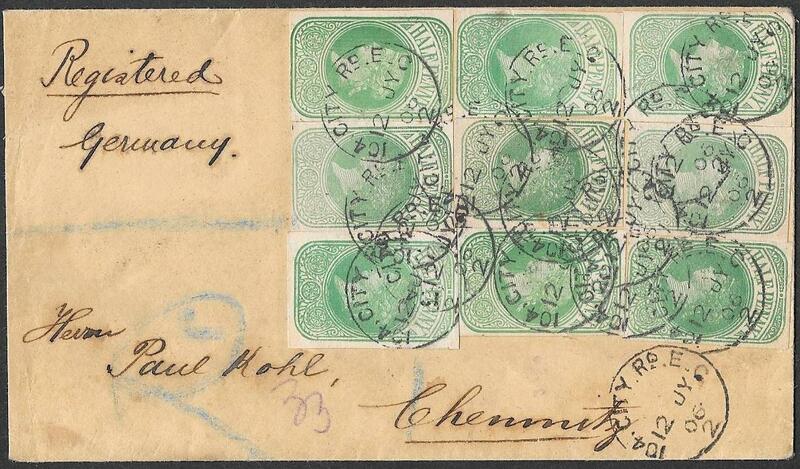 1/2d SG213, superb used BLOCK of 9, tied to a registered envelope from London to Budapest. and tied by Charing Cross Registered Ovals for APRIL 17 1900 – the DAY OF ISSUE. 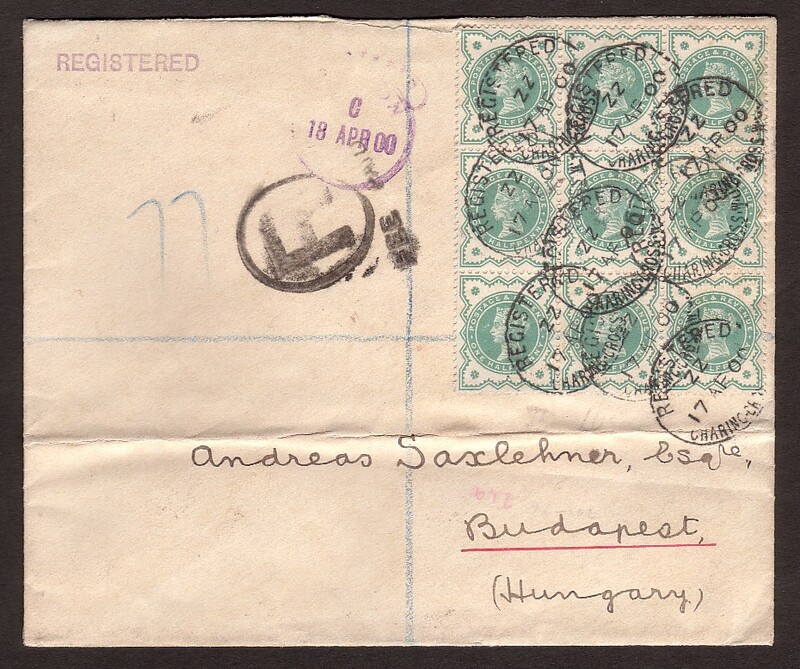 and a Budapest arrival cds for April 20 1900.
a block of 4 that we saw in an International Exhibition in 1995: the latter was not on cover. In the 2017 Booth FDC Catalogue, a single on cover with a First Day cds is priced at £1,800. sold inclusive of the Buyers Premium for £1,426 at a London sale in October 2017.
or any other Jubilee value, used on its Day of Issue. It would make a truly memorable Exhibition item. fine example, a few short short perfs on the right side, tied to a wrapper to Alnwick by a superb Newcastle on Tyne cds for February 7th 1873. 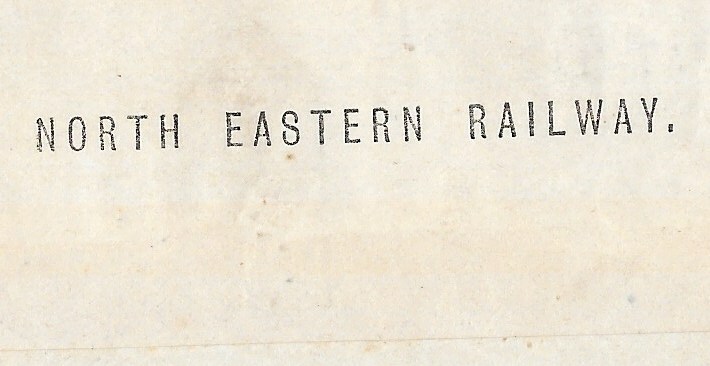 The wrapper is of the type used to send circulars and on the reverse is a printed NORTH EASTERN RAILWAY. There is a diagonal crease/fold near the bottom on the front. Difficult to find this stamp issue on cover with such a superb cds cancellation. 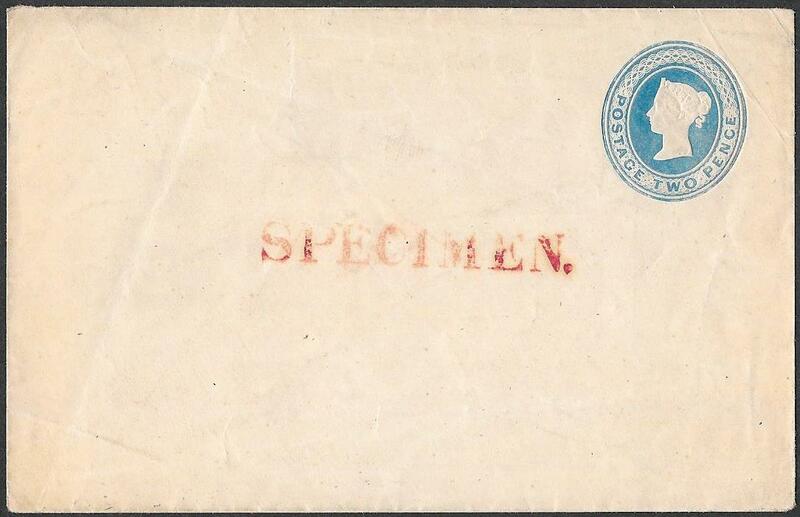 NB: the apparent browning around the stamp's perfs is a trick of the scanner. with a receiving cds for April 26th 1865 on the reverse. The poster, approx 42cm by 34cm, is in excellent condition. Printed in black, it is advertising the auction sale of valuable lands at SHAP. Sale to be held at The Greyhound Inn, Shap on Friday April 28th 1865. Two valuable Closes of Grass Land situated near The Kings Arms Inn, Shap. The Auctioneer was a Mr John Jackson, Penrith. Superb item in excellent condition: a rare survivor. NB: on the internet are uptodate pictures of the two Inns mentioned. 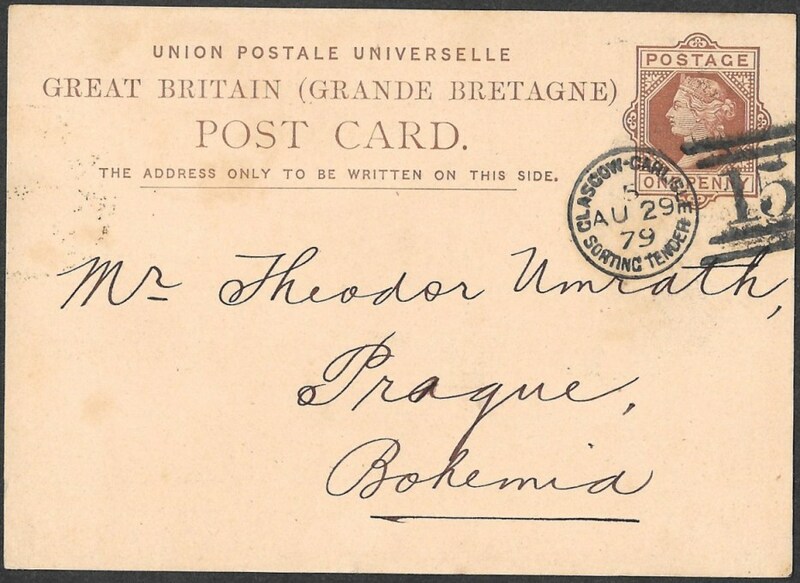 to the same addressee in THORNER near LEEDS from Newcastle upon Tyne. From the time code, it would appear they were posted at the same time. 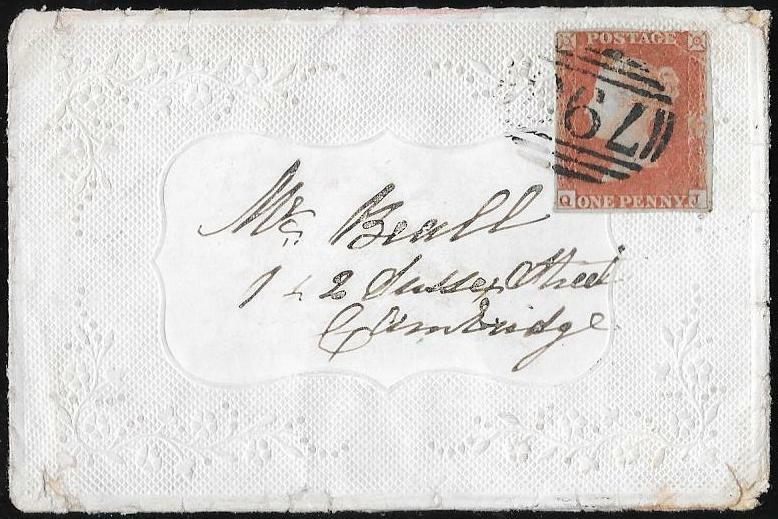 The handwriting appears to be different but the top envelope has a fine 1d red 'BG' plate 86 and the other a fine 1d plate 86 'AG'. The top envelope has a part of the rear flap missing. Intriguing to ask the question why the same sender would try and disguise their handwriting? Both are addressed to three young ladies! applied in almost the same place on the envelope and with the same codes. which might well stimulate a conversation. NB: the house, Thorner Lodge, can be seen on the internet. Both envelopes are finer than in the scan. is in a remarkable condition except for a very small portion of the top right flower. A very rare, and superb example, and especially so emanating from Ireland. 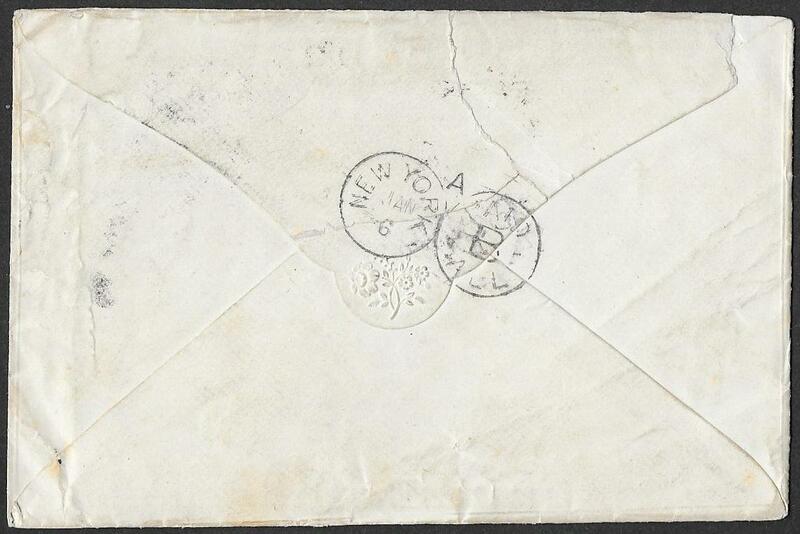 Envelope in cleaner condition than the scan suggests. 151904. 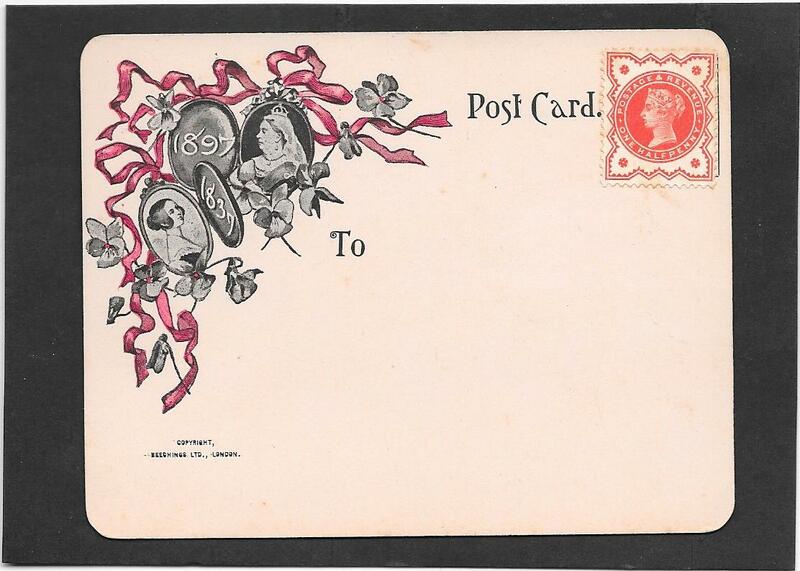 Two very fine Tuck postcards, both no.382: one mint and the other a very scarce used example to Malden, USA. The 1d lilac unfranked - perhaps the post office official left the Queen untouched in view of the card's significance. the mint card photo is by Gunn and Stuart and the used card photo by W and D Donney. More photos of Queen VIctoria by these photographers are available on the internet. A very scarce and attractive pair. NB: the brown marks on the used card are a lot fainter than in the scan. 151881. 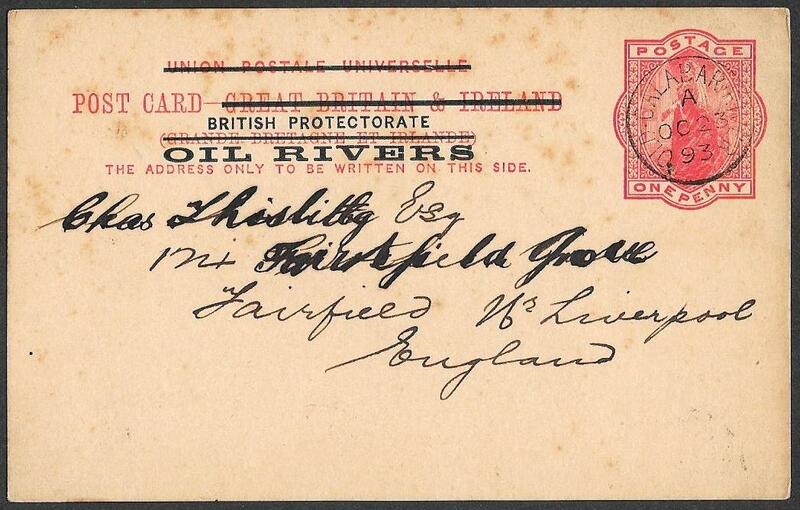 UPU 1d carmine post card overprinted British Protectorate OIL RIVERS. OLD CALABAR RIVER for October 23rd 1893. Some age spots and no message or other postal markings on reverse. NB: the age spots are not as dark as the scan suggests. 151788. 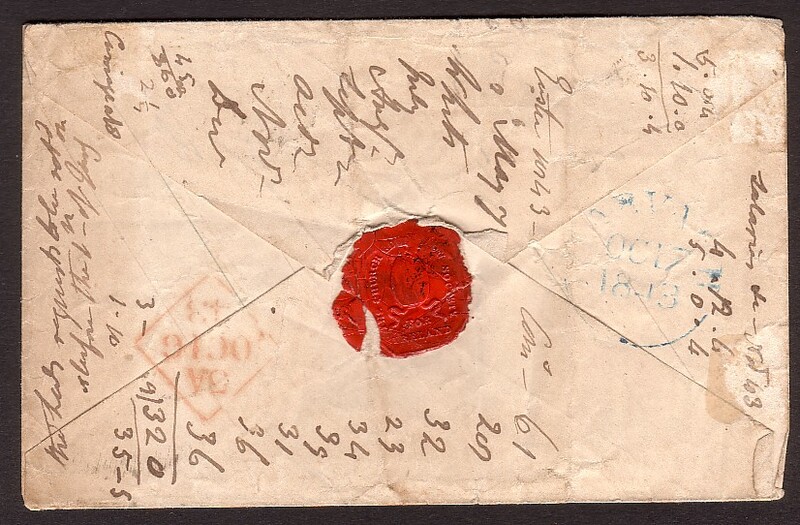 1841 1d unfolded envelope and and 2d folded envelope both overprinted SPECIMEN in red. The 1d is very fine and the 2d generally fine but with some light creasing. Prepared for circulation with the Post Office Notice describing their introduction. Very scarce as a pair. 151789. 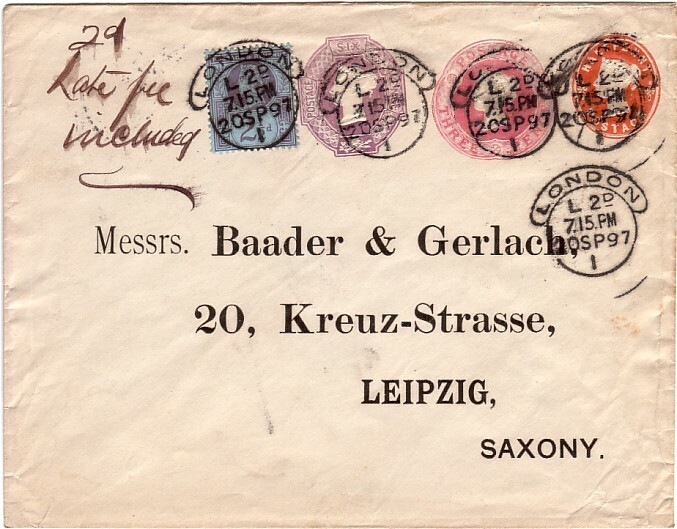 Registered envelope from London to Chemnitz, Germany, July 12th 1906.
paid by NINE QV 1/2d cut outs from stationery envelopes. Remarkable and rare franking and possibly a unique usage. The green of the cut outs is deeper than in the scans. 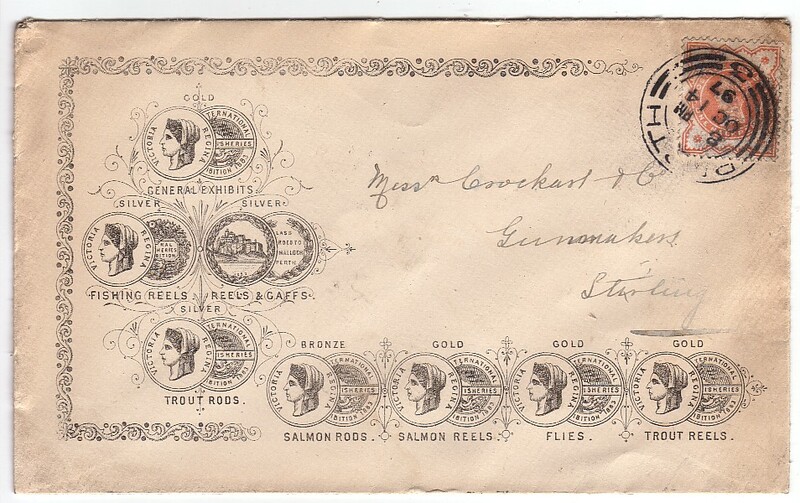 An attractive envelope which would make an interesting display item. 151782. Halfpenny brown wrapper, pre-cancelled by the rare type illustrated in Alcock and Holland. The 'S' in diamond can be seen and the number 11: the date is for September 1884. 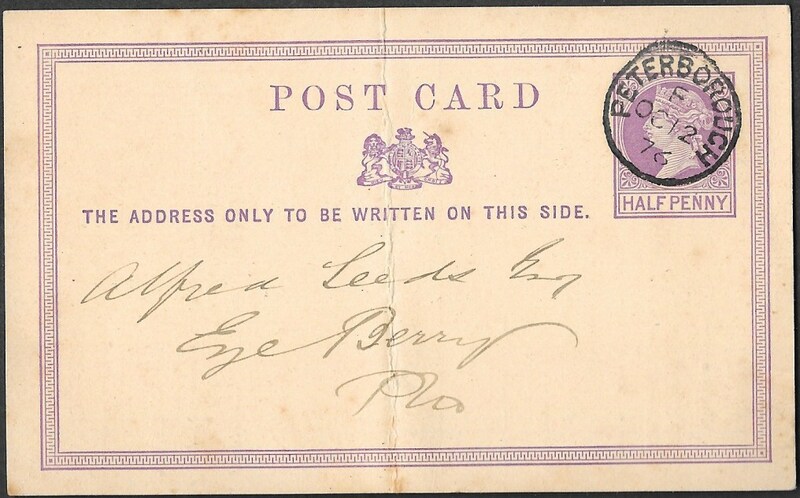 Addressed to 'Ward Room Officers, HMS Neptune, Queenstown': there are no postal markings on the reverse. she was purchased by the British Government in 1878 at the time of the Russian war scare. In 1884, she had been assigned to the English Channel Control so why was she in Queenstown - for repairs? A rare cancellation and the first we have been able to offer. NB: the wrapper in better condition than in the scan. 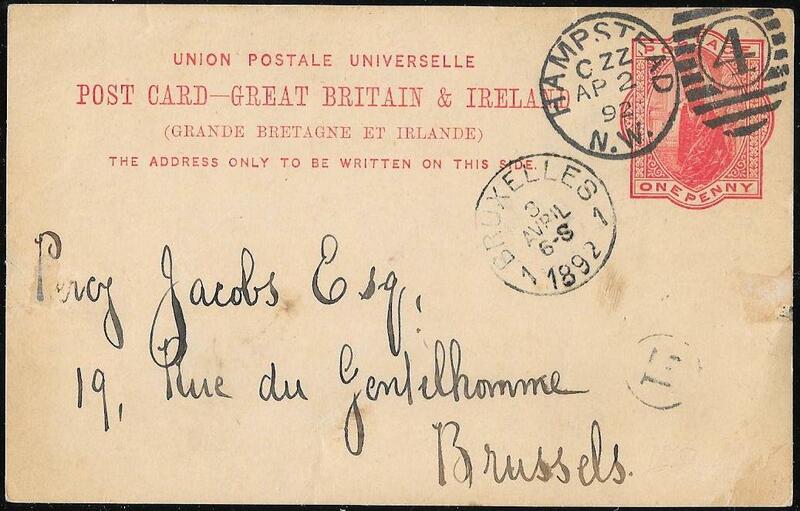 superb complete example, no message inside, sent from London to Antwerp. The two pence halfpenny postage made up with a 1d lilac and a Jubilee 1/2d SG197. 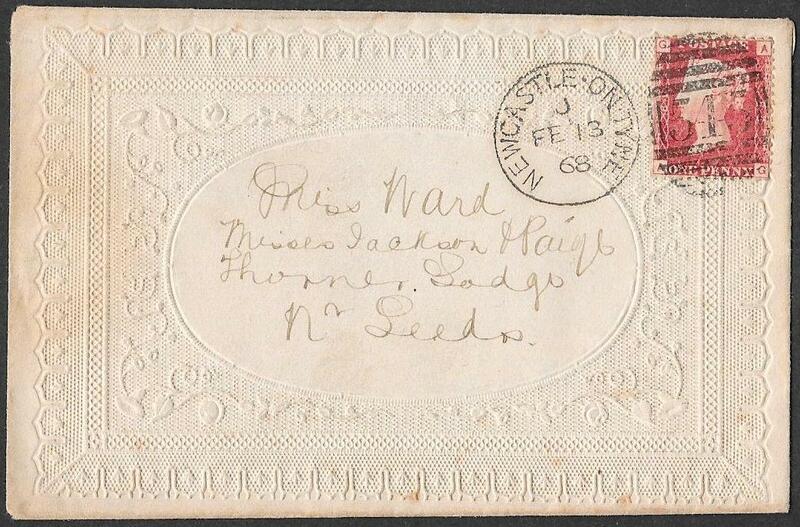 All cancelled by very fine London E C scrolls for FEBRUARY 12th 1892 - the SECOND DAY after issue. 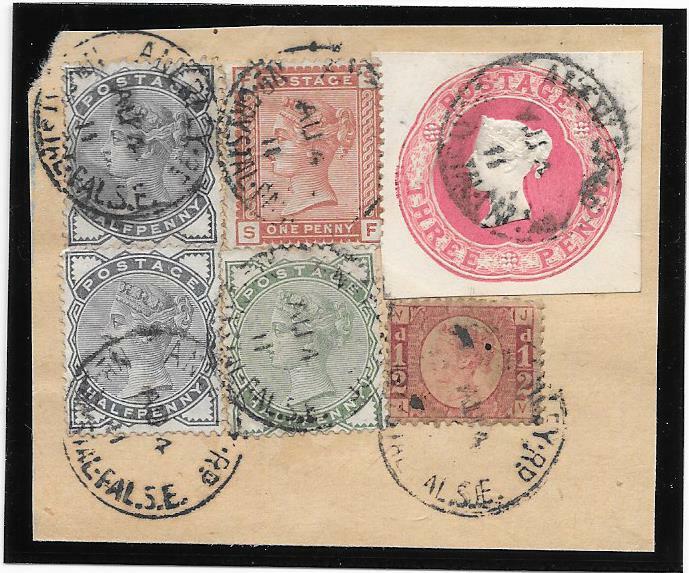 First Day of Issue examples sell for up to £2,000. Booths Catalogue, 2017 Edition, prices a FDI at £2,150. A rare and attractive item especially so in such superb, and complete, condition. NB. The scan does not show the pastel blue colour at all well. 151751. UPU postcard, 1d red printed on thin buff card, sent from Hampstead N W to Brussels. the SECOND DAY after issue. Booth, FDC Catalogue, 2017 Edition, prices the First Day of Issue at £2,000. Rarely is a FDI example on the market and we have seen such examples sell for well in excess of £1,000. Some peripheral faults but an interesting first sentence of the message. condition better than the scan, sent from London to Germany. Cancelled by a Hoster machine for January 14th 1891. 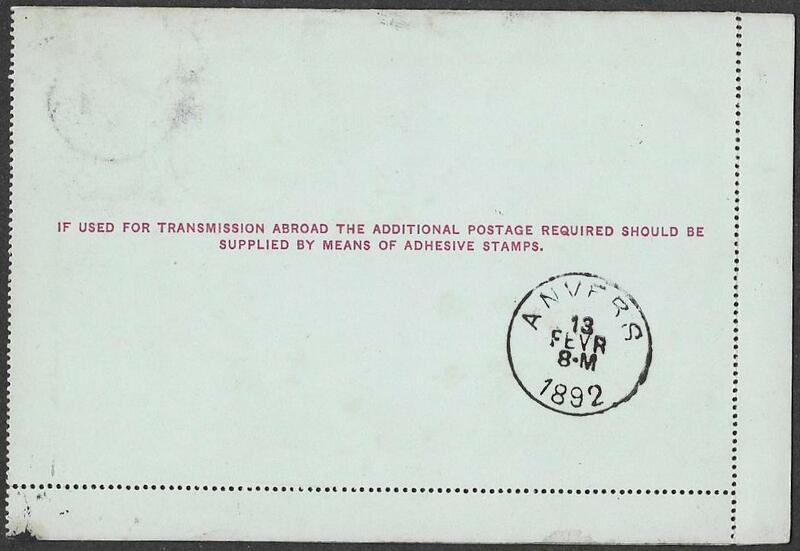 October 1889 - September 1891 for usage to Australia. Scarce usage to a European destination and with this cancellation. SINGLE '131' of Edinburgh and Contrary to Regulations as such. 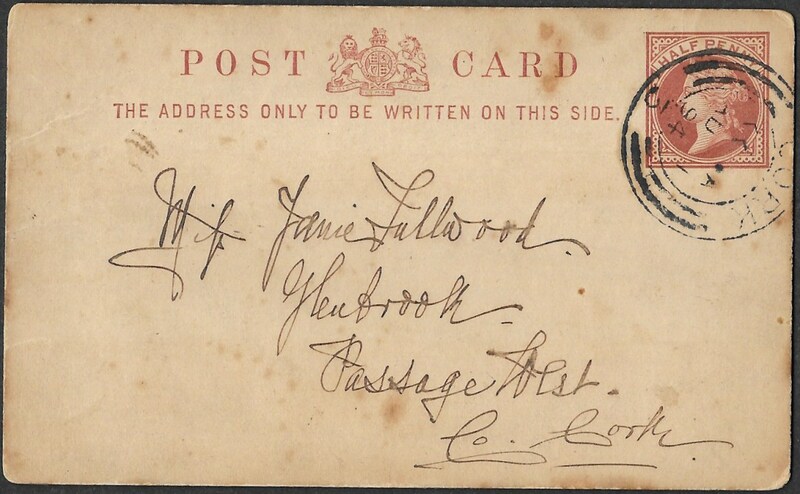 Addressed to 'The Glasgow, Dumfries and Carlisle Railway Office'. This Railway Company opened in August 13th 1846 and was taken over on 28th October 1850. Edinburgh December 30th 1846 cds on reverse and a receiving Glasgow date stamp for New Years' Eve 1846. Registered Edinburgh, McKay figure 1150, 'Scottish Postmarks' and rated RARE. Despite the faults, two single 1d reds are much scacer than a pair especially cancelled by a single numeral. Filing creases but overall the wrapper is in fine condition. A very scarce/rare combination of features. used locally within Liverpool and cancelled by a superb squared circle for MAY 24th 1882. Some light overall toning of the envelope but much fainter than in the scanned images. 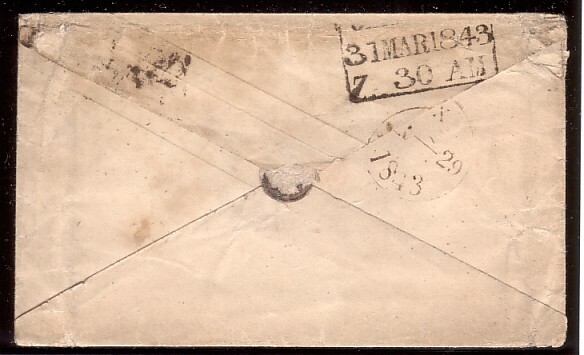 The envelope was carefully opened by a slit at the reverse as seen in the scan. other than at the 1890 Penny Post Jubilee Exhibition. A superb and very rare item. 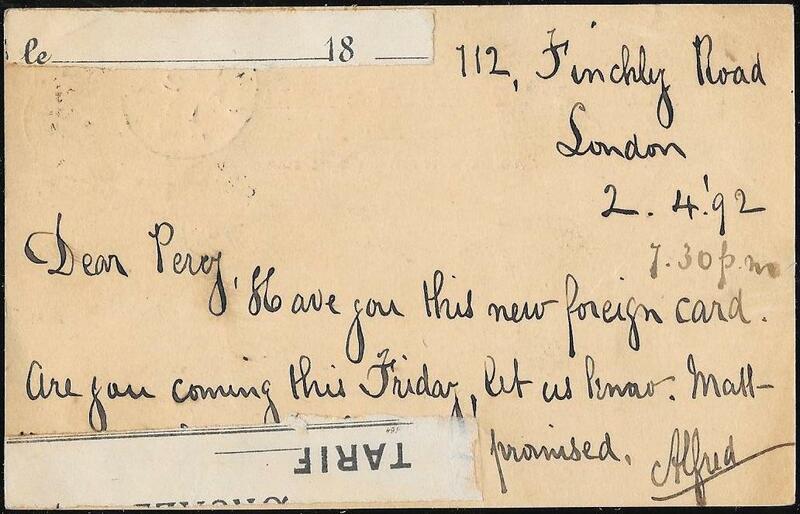 ‘Partly as a curiosity on the first day of their use I send one of the new postage cards’. Minor faults but very scarce when written with a message rather than having an advert. this Large Format, used on the Day of Issue, is priced at £1,000. The browning is not as pronounced as the scan suggests. we have been able to offer for some considerable time. noted for his pioneering 1890's book on Mulready caricatures. 151675. 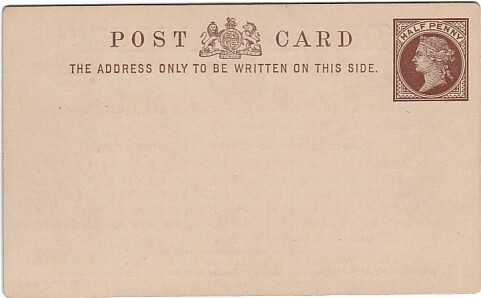 1891 3d British Empire Card. 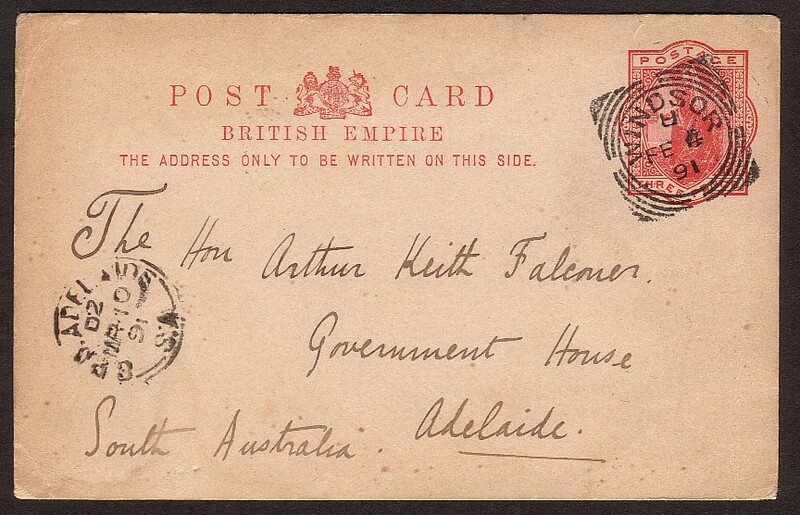 February 4 1891; Adelaide receiving date stamp on front for March 10 1891. 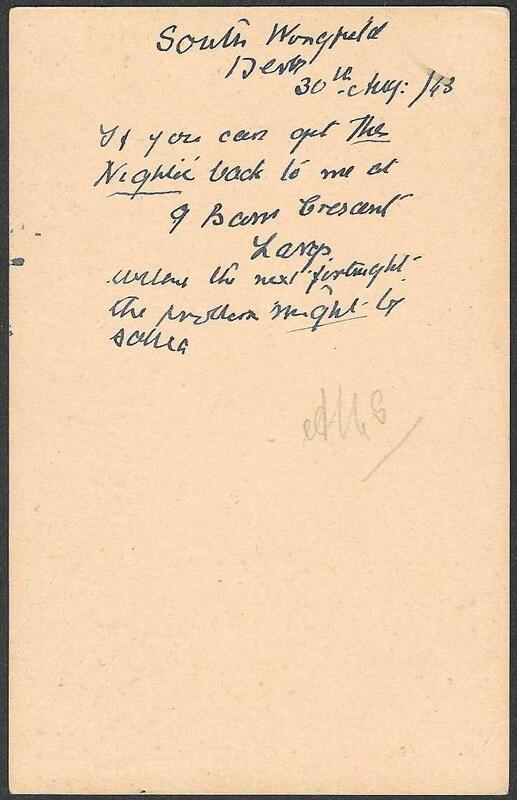 An interesting address and message as detailed in the scans. 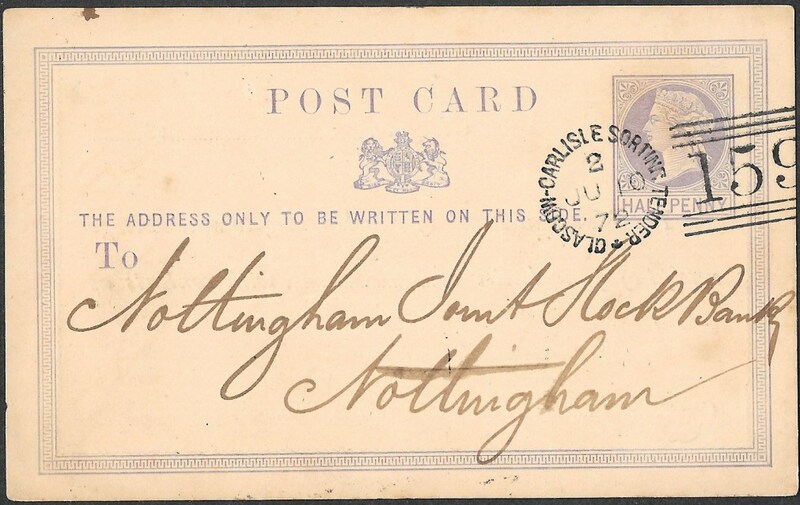 A very rare item, as the writer identified, even in 1891.
relatively soon after its introduction and a new postcard replaced it. 3-margined example with a diagonal scratch to the plate in the NE corner. This has resulted in an unprinted area. The stamp is tied by the '798' of THRAPSTONE, Northants. 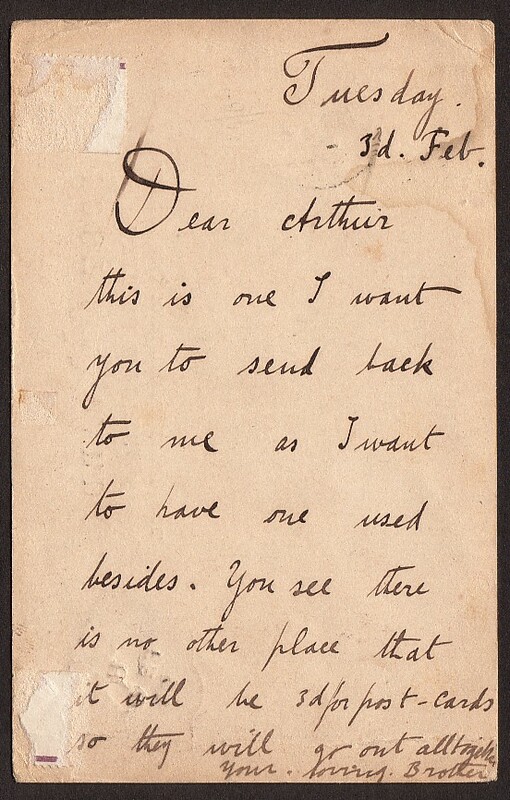 Sent to a Miss Beale in Cambridge, on Valentine's Day, February 14th 1854. On the reverse is a receiving cds for the day after Valentine's Day!! perhaps the recipient was very eager to get at the contents? A delightful fancy printed envelope with an embroidered and flowery design. Some peripheral faults but a rare example of a Valentine with a 1d red imperf. Rare also to find the 1d red displaying damage to the printing plate. Printed image of the Hotel on the front and on the reverse. 151576. 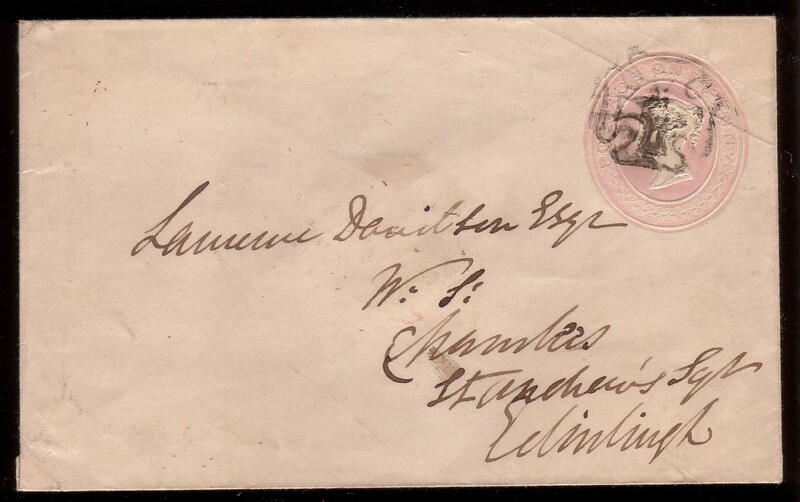 2d embossed envelope: very fine and registered from London to Germany, April 17th 1893. 1d SG F19 (issued initially in 1868) and 1d SG F22 (issued initially in 1878) tied with Registered WCDO cds's. F19 priced by Gibbons on cover at £140 and F22 at £120 - priced in the latest, 2011, Edition of QV Volume 1. A rare usage of two different fiscal issues. There is a Reichenbach receiving cds on the reverse. The price by Gibbons, in the 2016 GB Concise Catalogue, at £4,750 for the 9d on cover reflects its rarity. Unfortunately, the item is not addressed to Mr Sherlock Holmes! Unofficial Adverising Ring on full cover. with a 1d lilac and a 'Jubilee' 1/2d vermilion tied by the Preston Rd. Brighton duplex, May 29th 1891. 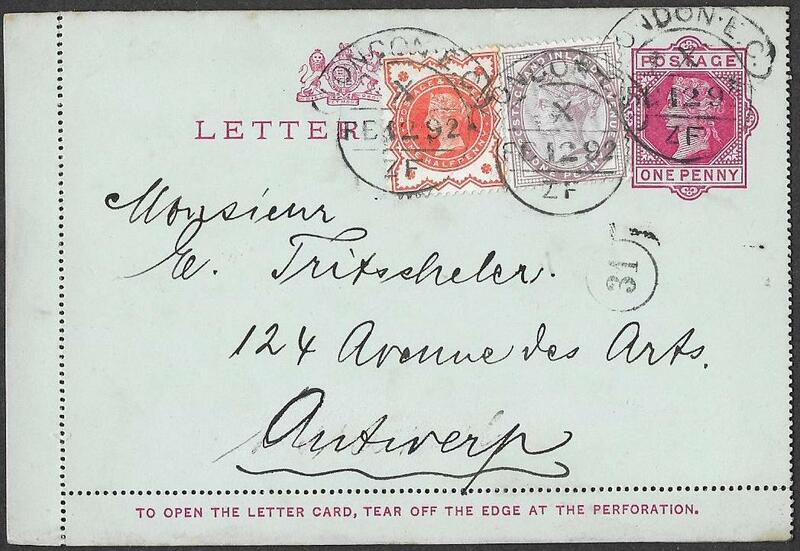 The envelope was sent to Rotterdam with a Rotterdam receiving cds on the reverse for May 30th 1891. The envelope has been opened at the base not the top and has a small preipheral fault at the centre top. This adverising ring is illustrated by Arundel in 'Advertising Rings'. His listing for this one is 36.2, 'the 1d pink envelope with an Orange Ring'. of which this is one, is 4 to 10 times the cut out price. A rare item and one of the few Unofficial examples we have been able to offer on full cover. NB: the brown mark at the top is not as pronounced as in the scan. very fine uncreased envelope addressed to Caversham. Cancelled by the Wokingham, BERKS machine for MAY 16th 1938.
but it appears to have got through the system. 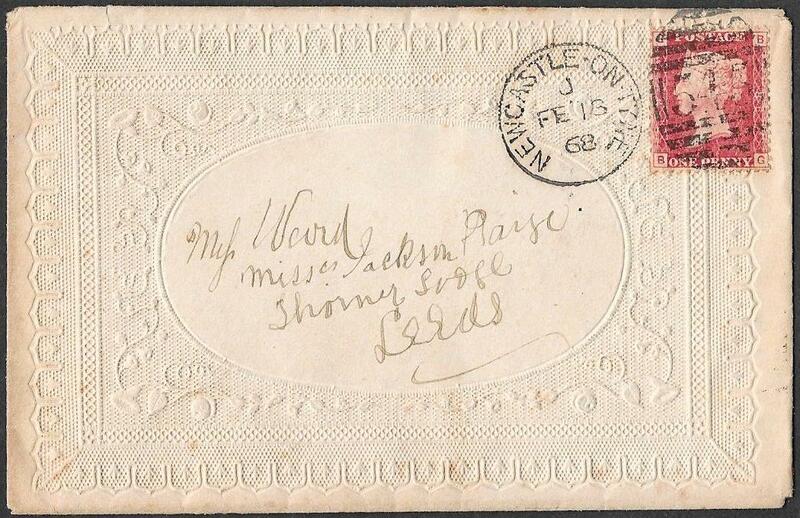 No postal markings on reverse. 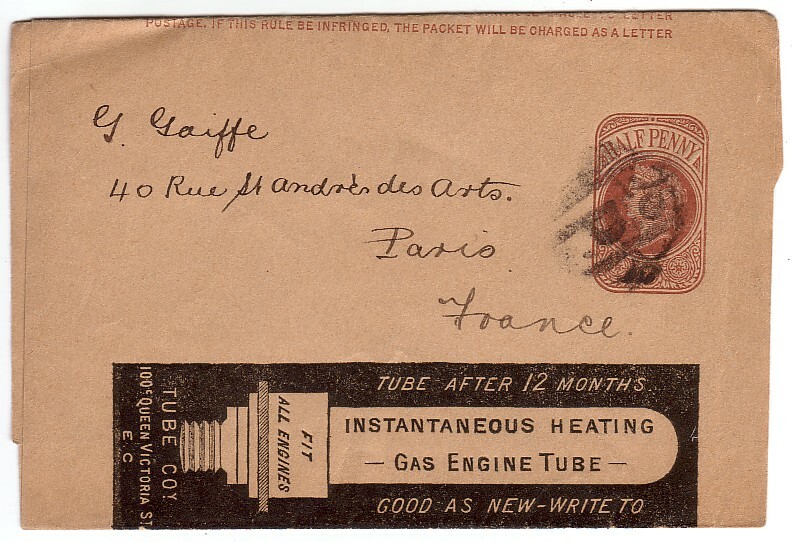 Very unusual and one of the latest used stationery envelopes we have seen. cancelled by three strikes of the Bangor and Crewe From West TPO, Sp 13 1882. This cds is Fig 137, but without code), illustrated in Wilson's TPO Part 1.
by the Railway Philatelic Group, this cancellation is priced 'above £250'. An interesting address too: more information on the internet re the Minton Tile Works. Very rare/unique item especially with multiple strikes. NB: some damage to the top flap on opening. The envelope is cleaner than the scan suggests. F size: January 4th 1878.
released in 'F' and the larger 'G' sizes on January 1st 1878. 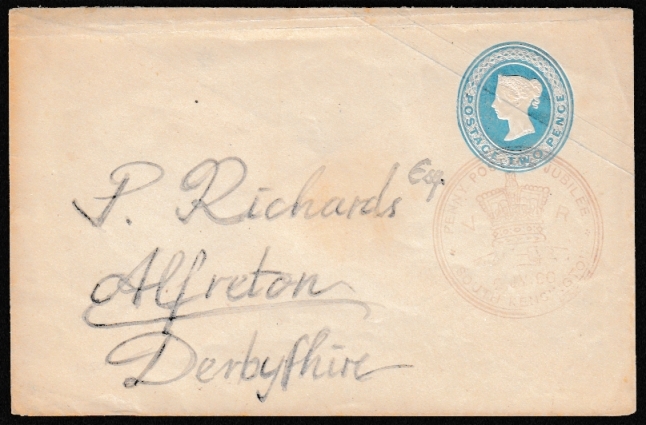 This 'F' size example was registered from Birmingham to Rotterdam with the postage rate paid by a 3d plate 9 SG 141.
a superb Birmingham Registered cds, in the same blue ink, for JANUARY 4th 1878.
it was sold at auction 15 years ago for an inclusive figure of almost £1,900. In 2004, we sold an 'F' size, used on January 3rd 1878, for £450. The postage fee in the January 1st and the January 3rd examples, was paid with a 1d plate number. 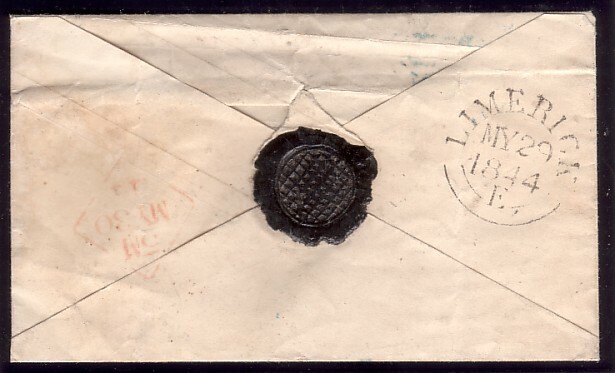 The printing issue of this envelope, on the reverse side's 2d embossing, is 11-12-77.
and the earliest known used with a numeral cancellation in a colour other than black. 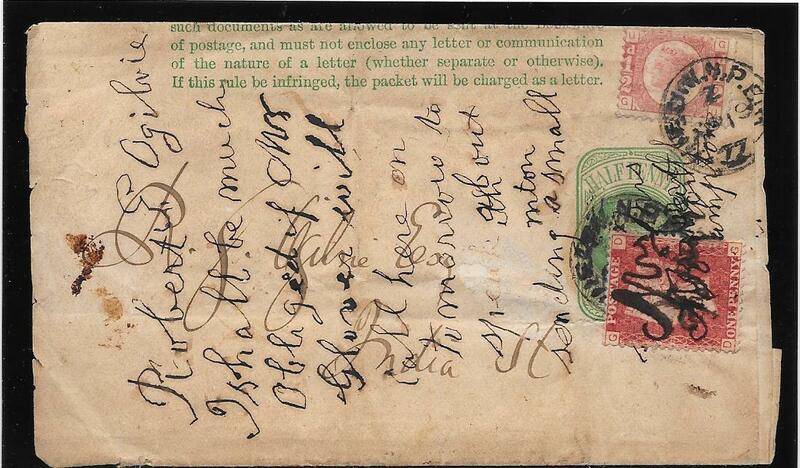 NB: the browning on the edges of the envelope both front and back is nowhere near as pronounced as the scan suggests. 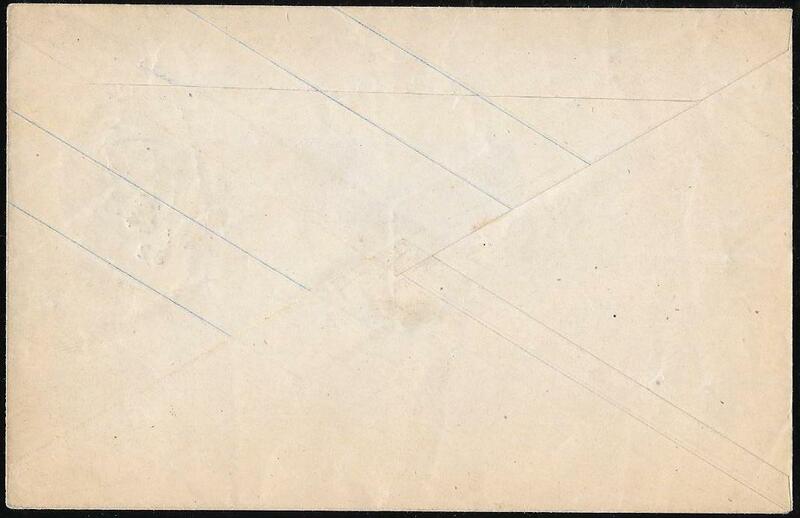 G size Registered Envelope: Earliest Known Usage. 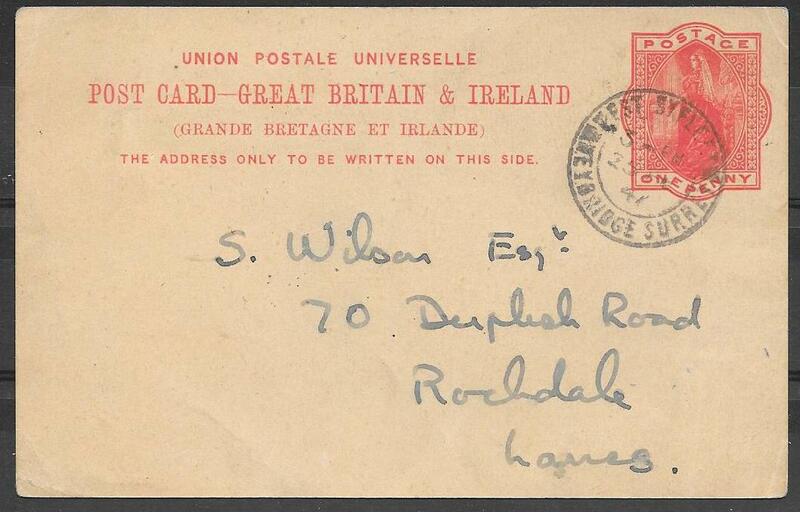 This 'G' size example was sent from London to Devonport on January 3rd 1878: clear Registered W.D.O. cds on the front. The larger size is much scarcer than the smaller one. 15 years ago for an inclusive figure of almost £1,900: in 2004, we sold an 'F' size, used on January 3rd 1878, for £450. 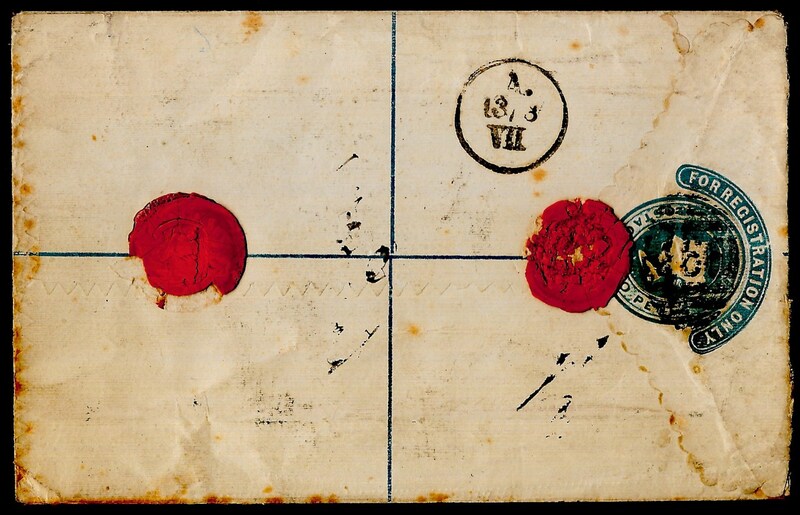 the 1d postage fee has been paid by a pair of bantam 1/2d's plate 11. London W/8 cancellation is rated very rare by Parmenter. A remarkable and an extremely rare item. NB: the few age marks are much fainter and less obvious than appears in the scan. 151539a. 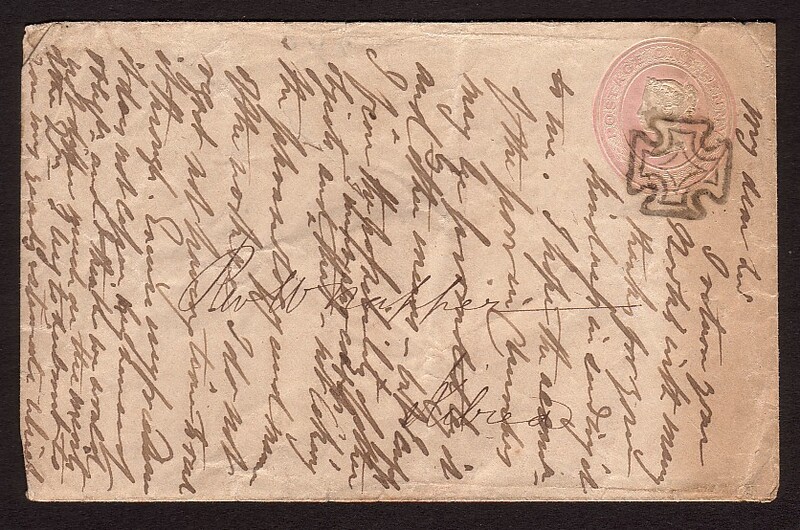 A fine 1d pink envelope registered from London to Bulgaria, February 17th 1891. BISECTED 2d, SG200 and a BISECTED 3d SG203. 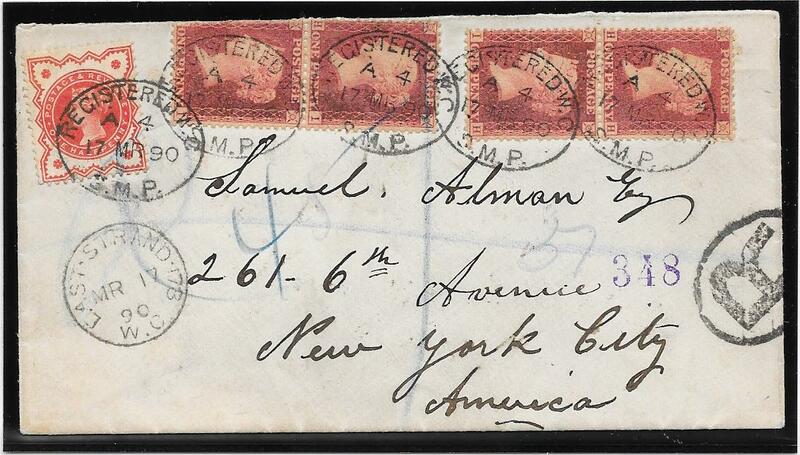 ONLY example we have seen with TWO bisected stamps from this issue on the same cover. To the left of the embossed 1d is an area that suggests there might have been another stamp. 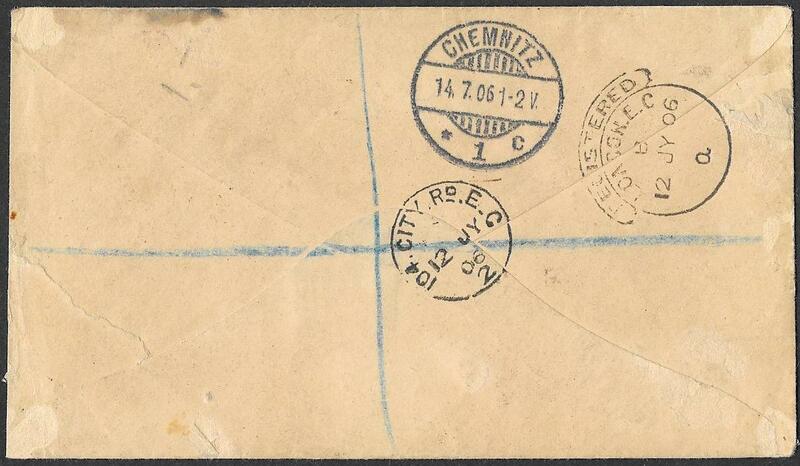 it is possible that the stamp was removed by the sender and the bisects created to save money. The Post Office official accepted the bisected stamps as no surcharge was applied. than the scan suggests as is the browning near the 1d embossed and at the left side. 151538. 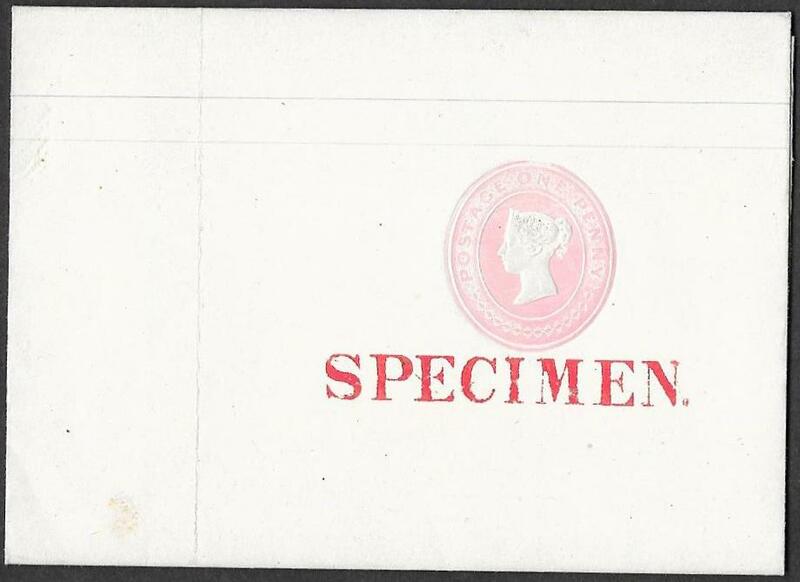 KEV11, two 1/2d's and 1d used on a fine Registered item sent within London, January 1st 1902 - the Day of Issue. Used in combination with the 1/2d SG213 that was being replaced. 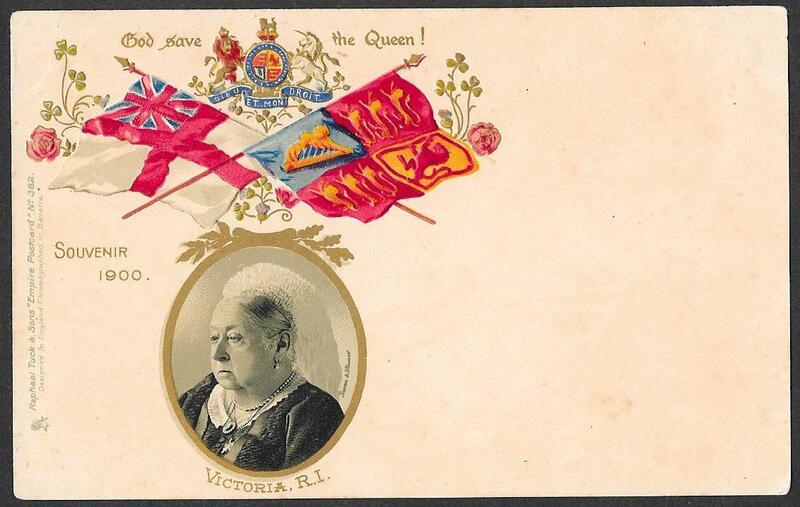 Unusually a label issued to commemorate Victoria's Diamond Jubilee in 1897 also attached. 8pm, January 1st 1902, the DAY of ISSUE of both these values. 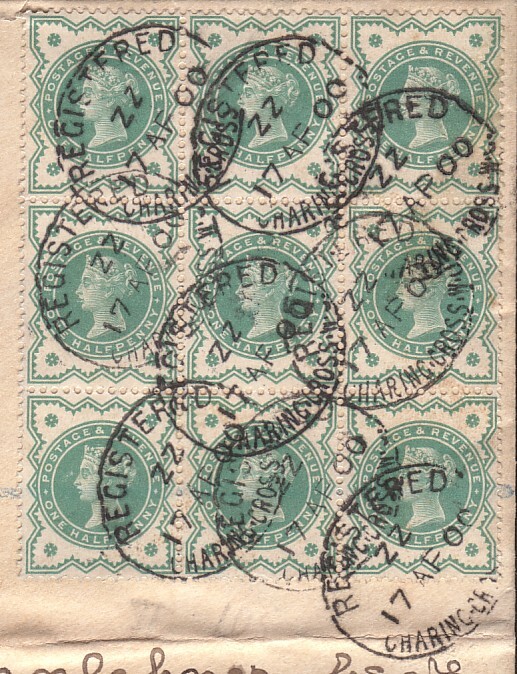 The 1/2d block shows the two left hand side stamps each with the split frame listed variety: Spec M1j. unpriced by Gibbons used but priced at £150 each in mounted mint condition. The only example of this split frame variety we have seen used on the Day of Issue. A superb and rare pair of blocks. 151630. 1d SG219: superb used corner marginal example, no gum. December 31st 1901: the DAY BEFORE the official issue date for this stamp. 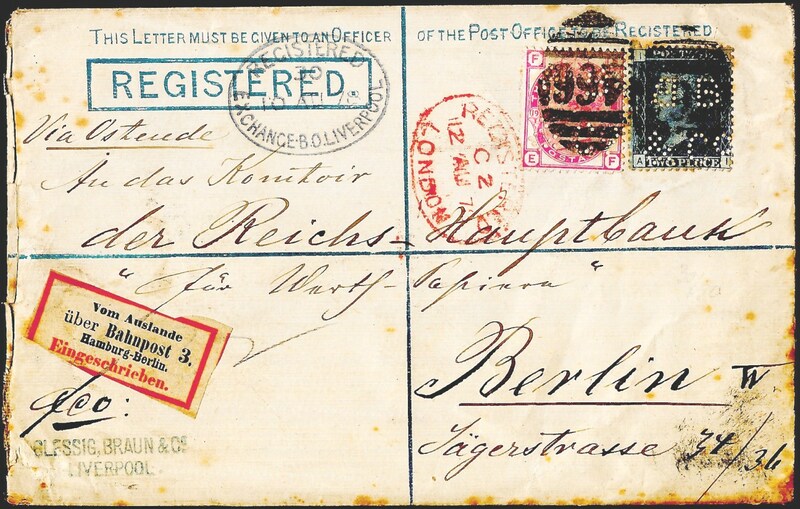 Late usages on Registered Envelope to Germany. 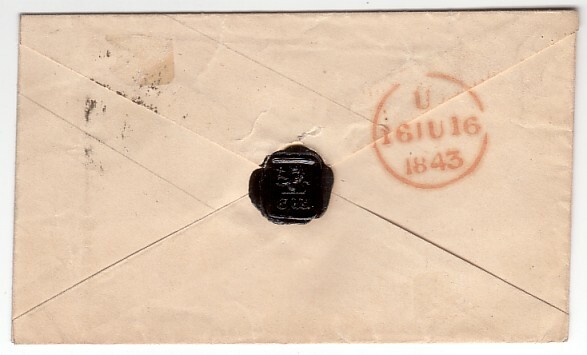 on One Penny embossed envelope, Registered to Germany. of SG8, SG 43 and SG168. Some faults but a rare example of a late usage of both line engraved and surface printed issues. NB: envelope in better condition than the scan. tied to part of a wooden case/box by a Registered Oval - date unclear. 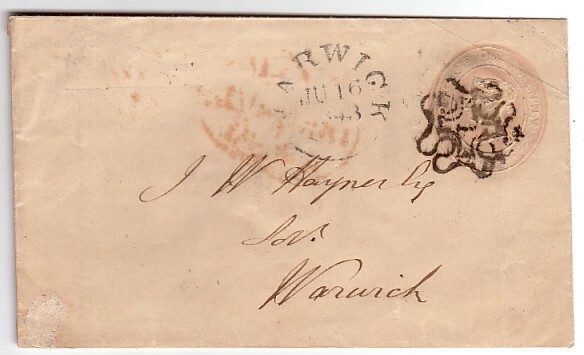 Addressed to The Town Clerk, EXETER. Remarkable item of which we have never previously seen the like!! A talking point and worthy of being displayed. tied to a neat, clean REGISTERED wrapper by the '436' of LANCASTER, m/s '6' in red. 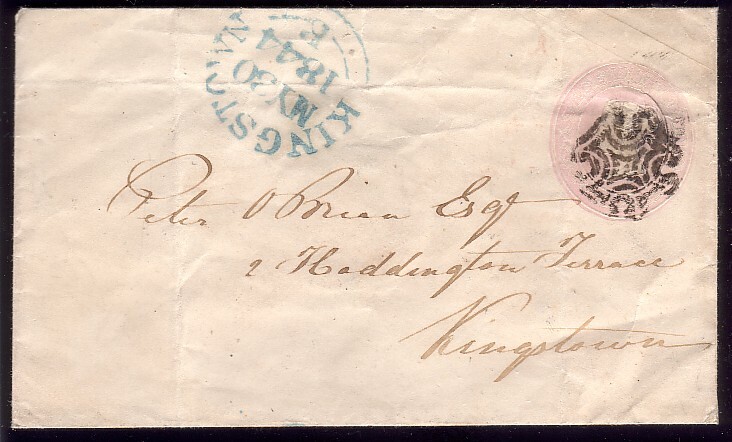 also in blue on the reverse for May 5th 1848. The registration fee was reduced from a 1/- to 6d on March 1st 1848 and remained at that figure until 1862.
and the earliest we have seen with the fee paid in stamps. A superb, rare and attractive REGISTERED item of Exhibtion quality. 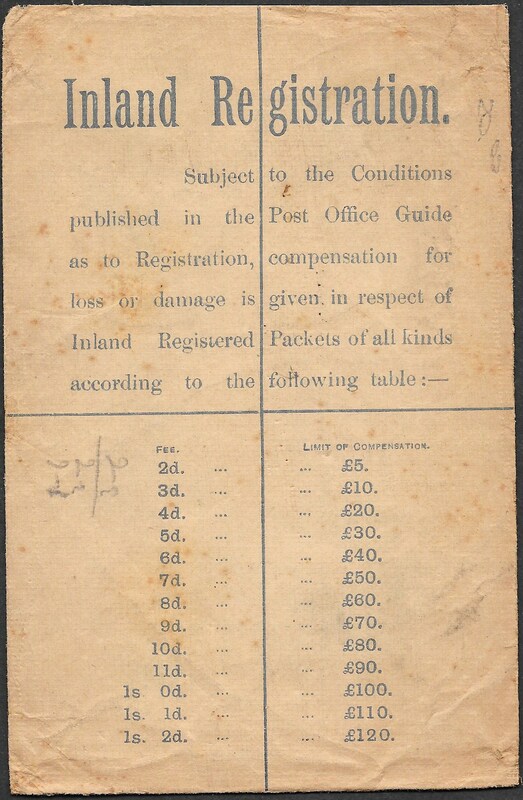 the Post Office, Wellington, 'Until called for': the paid registration fee of 1/- in red m/s. Fine/very fine Liverpool date stamp on the front for March 9th 1843. Even as a front this is a scarce registered example used during the MX period. NB: it is much cleaner than the scanned image. 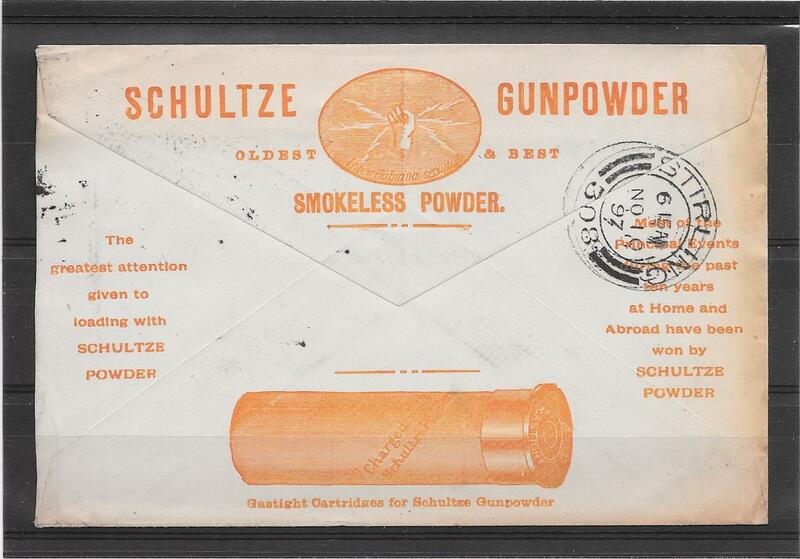 Schultze Oldest and Best Sporting Powder. 151454a. 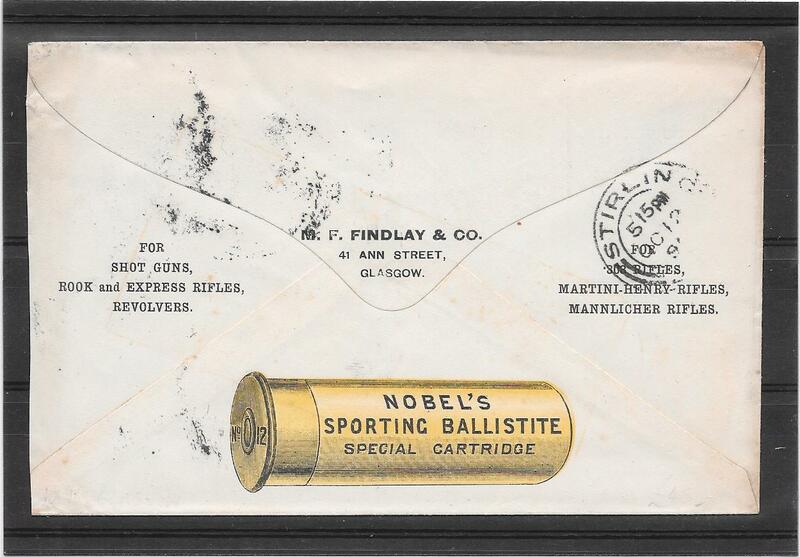 SG213, 1/2d 'Jubilee': tied to advertising envelope depicting men shooting pheasants. Stamp cancelled by a London EC 1 G, Parmenter Rarity F ie RARE. 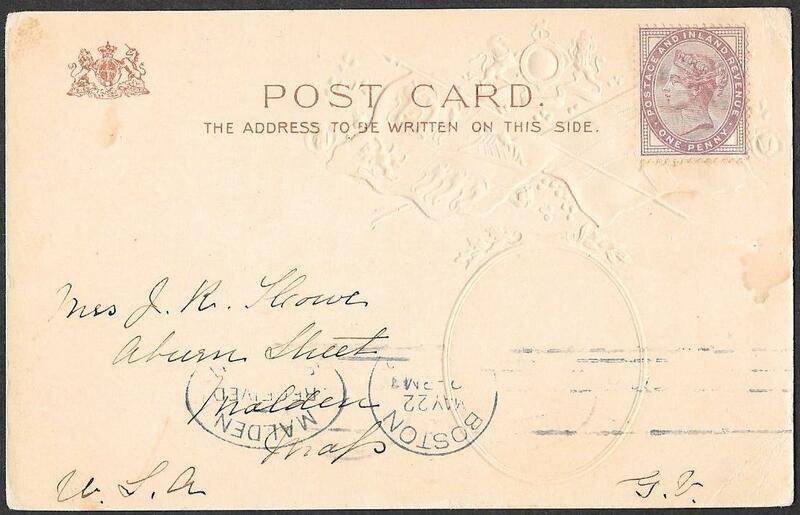 On reverse a STIRLING receiver for February 14th 1901. 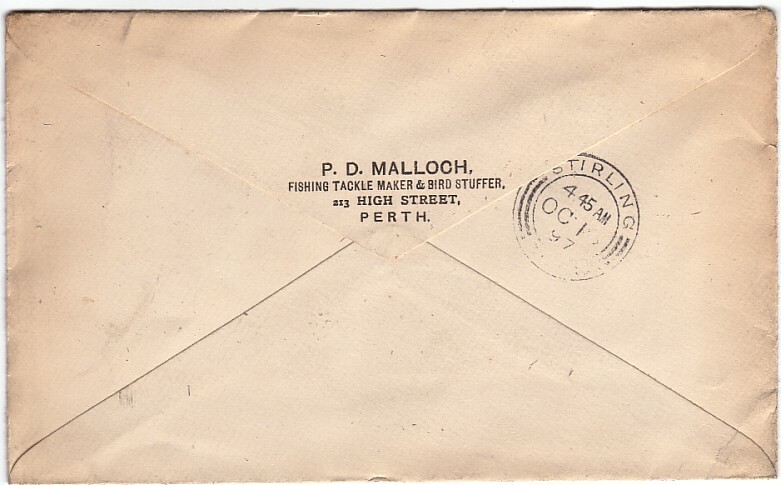 Envelope in superb condition as is the colour advert. 1d rate with pair of SG197 1/2d's, October 12th 1896. A rarer type of advert. 151470c. 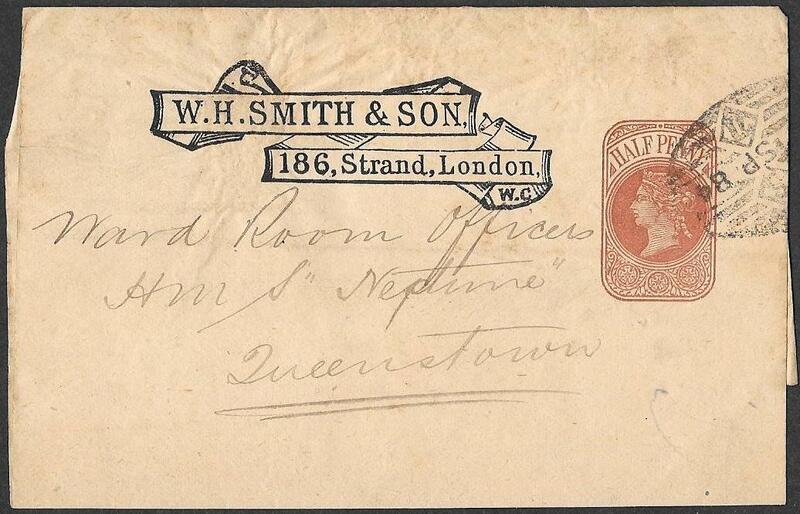 Advertising envelope to Stirling from London, 1d lilac, November 10th 1897.
and a World Record by the Noble Marquis. NB: envelope is cleaner than appears in the scan. celebrating the Diamond Jubilee of Queen Victoria. Superb condition with the printed images much crisper than the scan. In Memoriam for Queen Victoria. 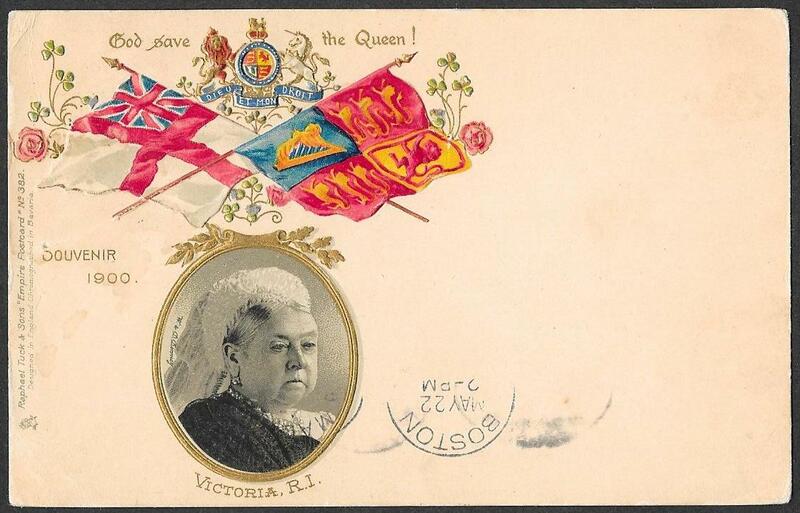 'In Memoriam, Today February 2nd 1901, Our late and beloved Queen Victoria was buried'. Have not previously seen this card used on her burial day. used from Weybridge, West Byfleet, February 25th 1947. 1947 saw some of the worst snow ever across the UK. by the Post Office for postal usage in 1915. No surcharge so it got through the system. Small corner crease top right. Rare 5d Rate: London numerals on piece. tied to piece by London '12' in diamond in oval of bars. by Rowland Hill to encourage the circulating libraries of the time. The charge was 6d up to 16oz: this piece has printed on it 'Under 12 oz'. but no halfpenny stamps had been issued at that time so they rounded it up to 5d? A rare and unusual usage which would repay further research. DUBLIN distinctive Cross: rare type with break. with very fine strike of the characteristic DUBLIN cross. Seen clearly at the right is the BREAK in the outer cross. with NONE for usage on the 1d pink envelope. but much scarcer usage on embossed envelopes. Edinburgh NPB cds's, 1/2d plate 10 and 1d plate 197. Appears to have been reused to send a message re gloves! 1d pink uprated with SG52 Plate 3 to Chicago. 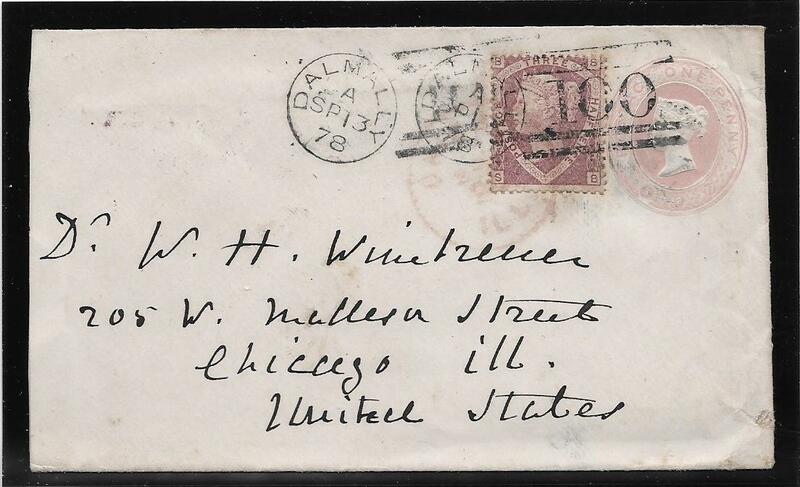 tied by DALMALLY duplex for September 13th 1878 and sent to Chicago, USA. 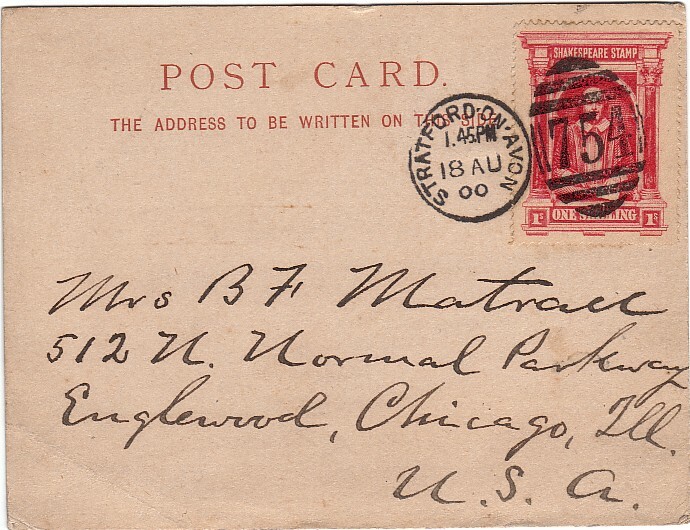 On the reverse is a purple CHICAGO MAIL CARRIER cds for September 27th. A rare usage of this stamp on a 1d pink envelope. TWO pairs of 1d SG 40, originally a block of 4, 'HH-II'. SG40 issued in 1857 so a very late usage of this stamp. and 'HI' crossed by a registered blue crayon but 'HH-IH' are very fine. 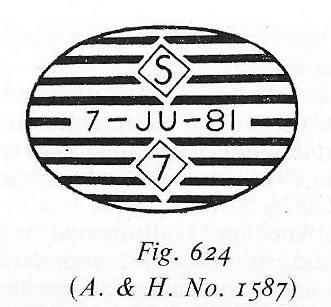 Registered SMP (London) ovals for March 17th 1890. The latest usage of 1d SG40 on registered mail we have seen. 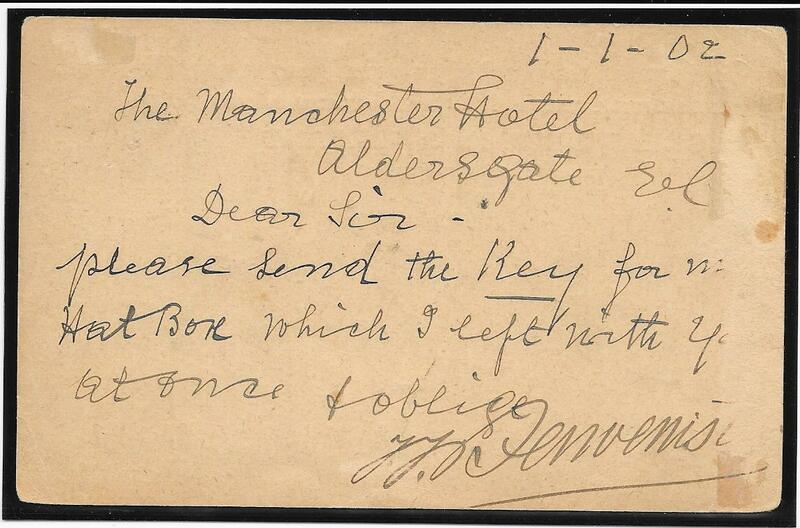 sent from The Manchester Hotel, Aldersgate, EC and dated 1-1-02. Message reads ‘Please send the Key for my Hat Box which I left with you at once and oblige’. London EC Scroll for January 1st 1902, the FIRST DAY OF ISSUE of this Edward V11 stamp. Rare to find it used on the day of issue with a QV stationery item. The outer black lines beyond these images is a trick of the scanner. thought that it was no longer allowed to be used because of the new issue of Edward V11 stamps? 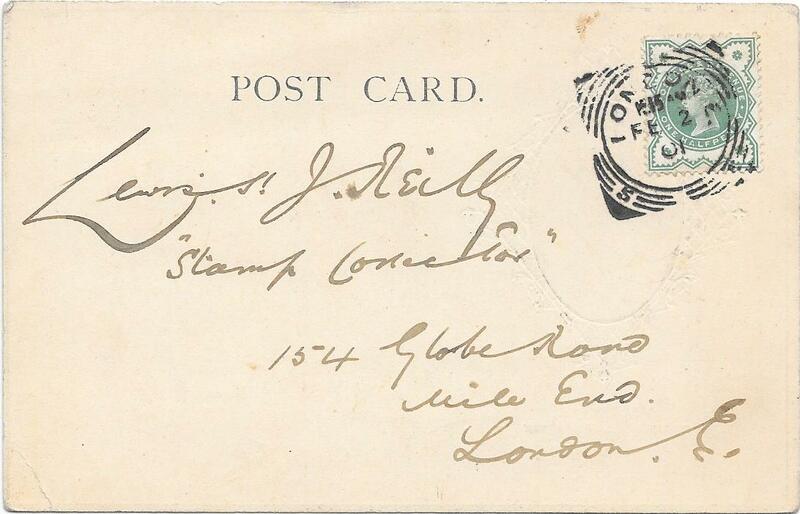 The message on the card clearly indicates that it was not posted for philatelic reasons. From Controller of Stamps - Somerset House. Somerset House to the Stamp Office in Driffield - January 18th 1881.
illustrated by McKay in 'Postmarks of England and Wales' fig 3288.
used from Somerset House and received by them in 1880. Alcock made no reference to it and we have not seen it previously. With its January 18th 1881 date it may well be one of the earliest surviving examples. 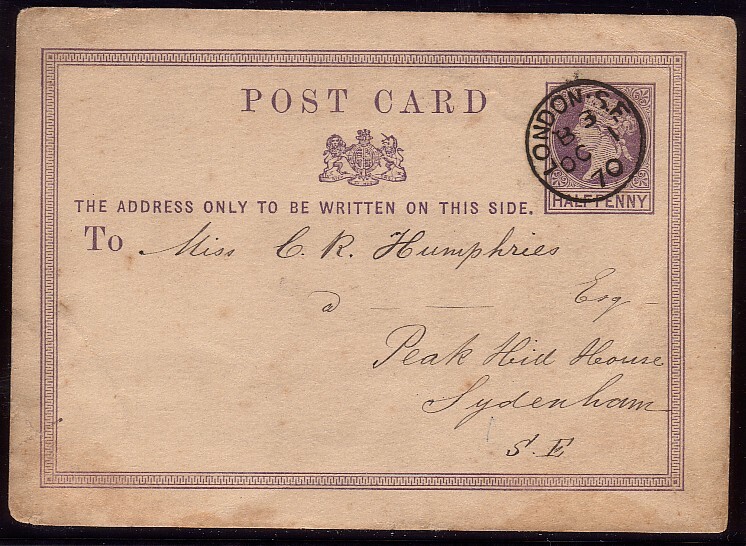 Envelope in excellent condition, there are no postal markings on the reverse. 151339. 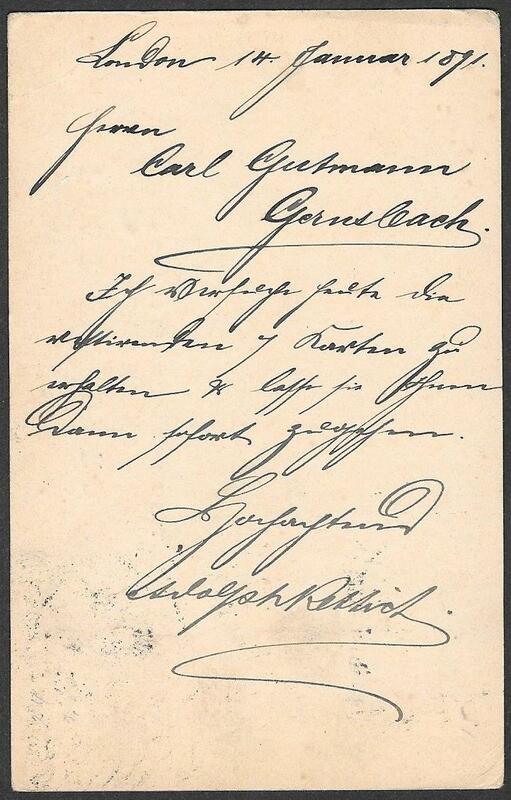 UPU card to Germany, written in German from H Raschen & Co Liverpool, 30/11/89. Liverpool Station LATE BOX hooded cancel for November 30th 1889. 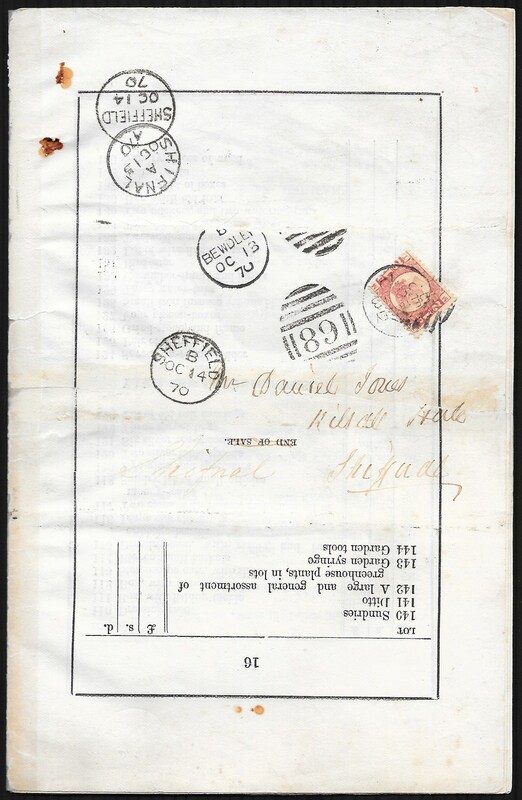 Parmenter in his book on Late Fee Mail records this as Die 2 and is only seen on Foreign mail and rated RARE. Diagonal light creasing at the bottom right corner but otherwise fine/very fine. on full cover of this type of Late Fee cancellation we have been able to offer for a number of years. 151371. 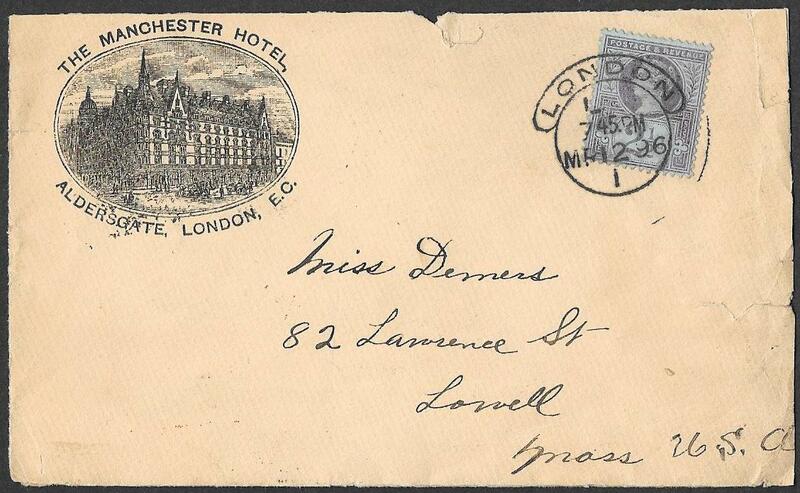 Very fine clean envelope from Manchester to Zurich, Switzerland. The 5d postage paid by 2d SG200 and 3d SG203. The 1/2d SG197 has been added to pay the LATE FEE. Each has been cancelled by the MANCHESTER LATE BOX Hooded Circle date stamp. he rates it as scarce but from our experience we would put it in the Rare category. the 19 should be alongside October with the year in two numerals at the far right hand side. In this example the day has been put where the year should be and the year is missing completely! would soon have been picked up as there was no year date indicated. We know it to be October 19th 1895 because of the receiver cds on the reverse. Clearly a rare item and in excellent condition. NB: this item would go well with the Liverpool Late Box item 151339.
printed Memorandum from Dobbin, Ogilvie & Co., Cork requesting a quote for Liquid Glucose. 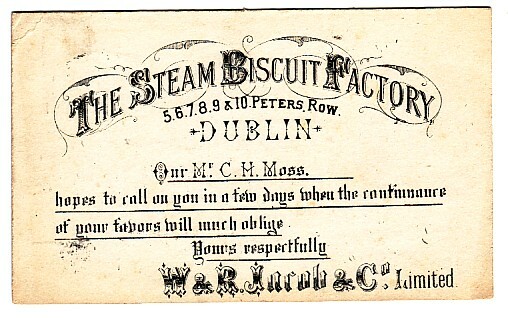 The card cancelled by the distinctive and scarce Cork scroll date stamp, December 11th 1888. 151330. 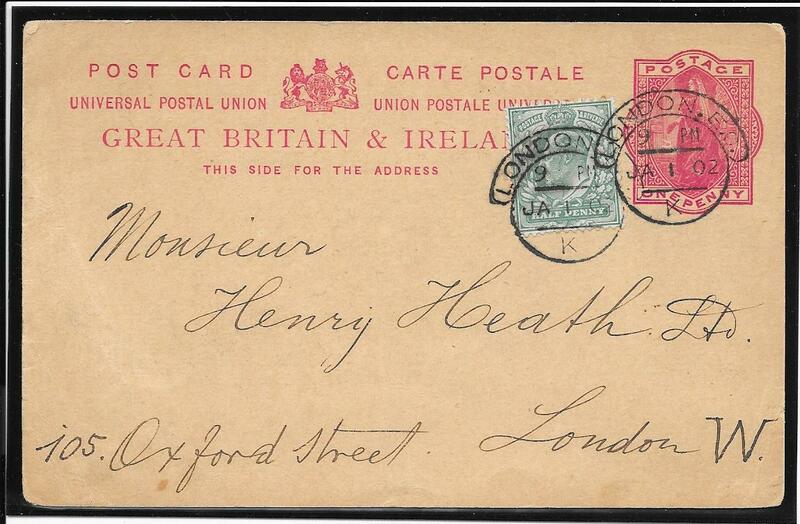 August 4th 1911: piece with various QV stamps and a cut out tied by Anerley Road - Crystal Palace cds’s for this date. All were legal tender at that time and made up a 6d rate. Perhaps the person posting it expected the item to be cancelled with the Flag Duplex! NB: the paper is much less brown than the scan suggest. A RARE item despite the light cancellation and overall in better condition than the scan suggests. 151255. 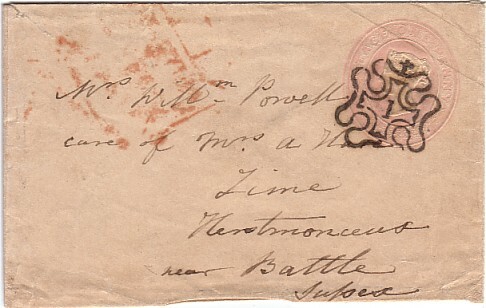 1d pink envelope, London to Battle, July 12th 1843. Clean but with a small peripheral fault top left corner and some light creasing at the bottom. Cancelled by a very fine/superb Number 1 in Cross. Rockoff, Volume 3, records four 1d pink envelopes with this cross but the one offered here is not listed. 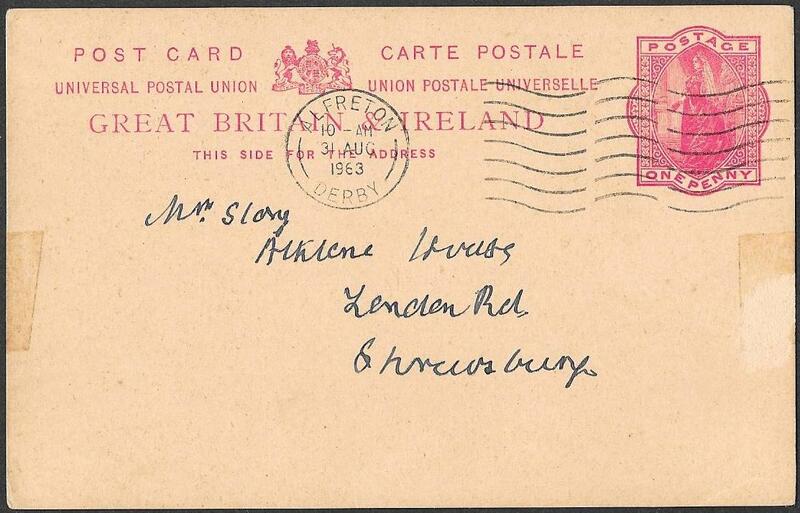 This quality of strike is seldom found on stationery envelopes and on a 1d red cover is priced by Gibbons at £550.00. uncreased and cancelled by a fine/very fine sideways Number 1 in Cross. but the one offered here is not listed. A 1d red cover is priced by Gibbons at £550.00. 151254. 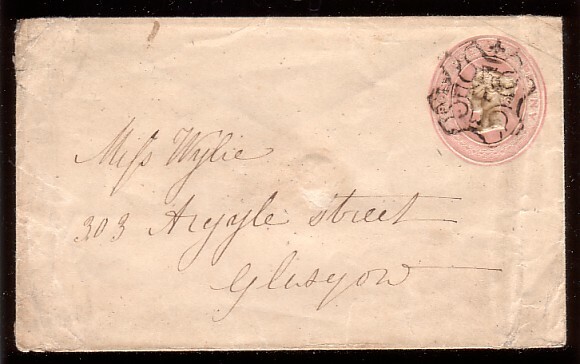 1d pink envelope London to Glasgow: neatly cancelled by a fine/very fine Number 4 in Cross. London cds for March 29th 1843 and a Glasgow boxed receiver for March 31st. 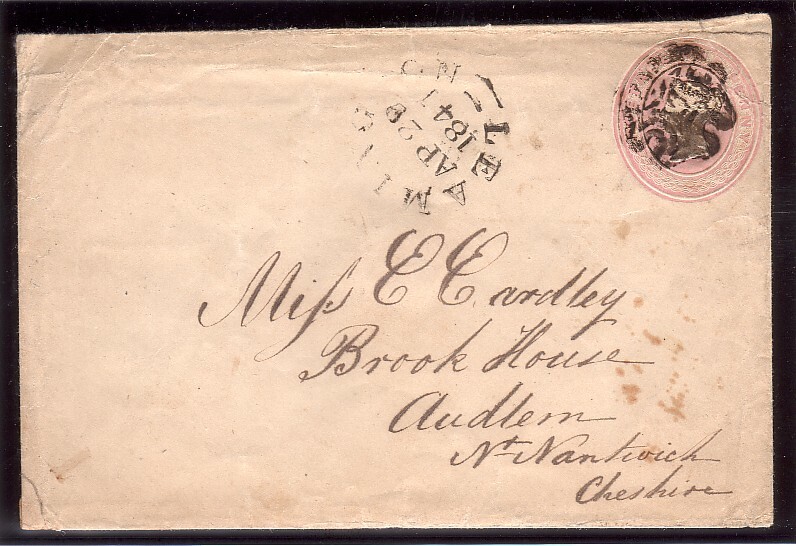 the earliest recorded by Rockoff, Volume 3, on a 1d pink envelope is April 24th 1843. 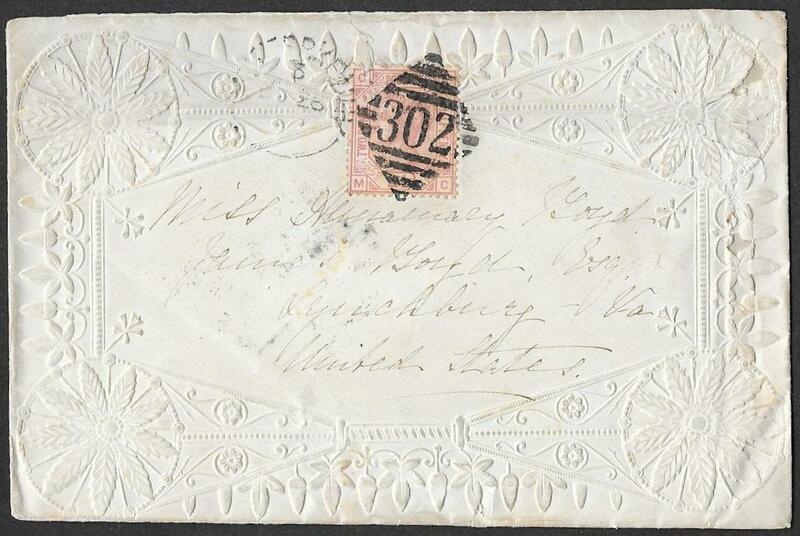 This example used on March 29th 1843 is the earliest known usage on an embossed envelope. Gibbons prices a 1d red cover with this number in cross at £2,000. The Number 4 in Cross on a 1d pink is considerably rarer and especially so with this quality of strike. NB: the item is in better condition than the scans suggest. 151244. Compound embossed envelope, 1/2d, 3d and 6d with SG201 added making postage total of 1/-. This paid for four times the single 2 1/2d rate plus 2d LATE FEE. 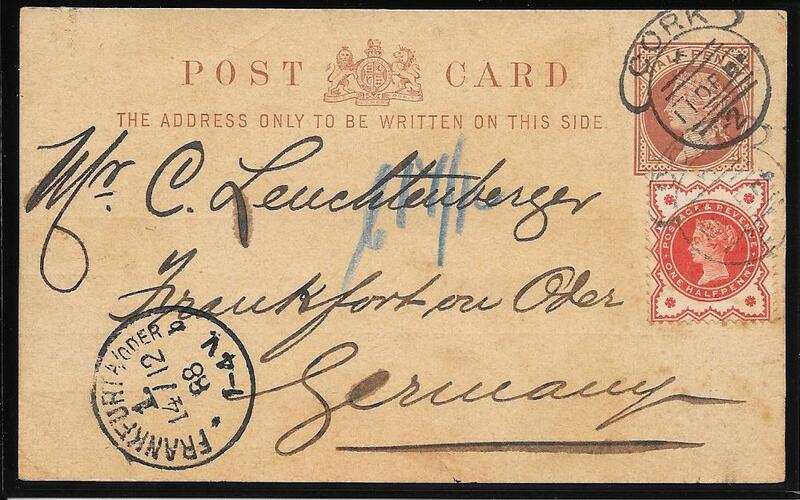 Fine envelope, London to Leipzig, with FIVE superb to fine strikes of the London Hooded Circle Late Fee 2d Number 1. 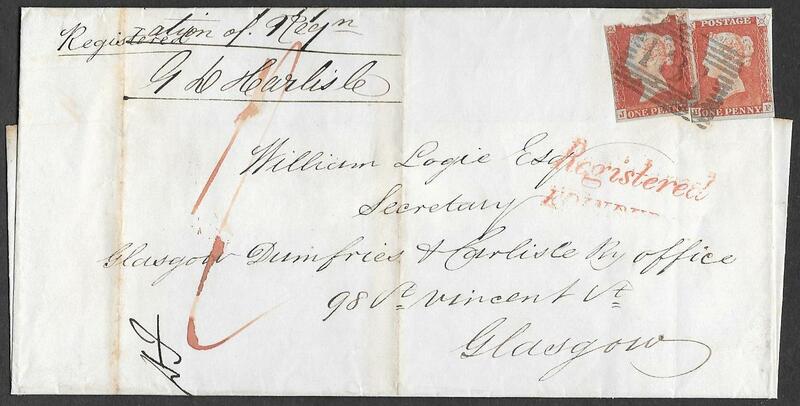 Parmenter in 'London Late Fee and Too Late Mail, 1840 to 1930', on page 55, illustrates this cancellation. He notes it as Rarity 'H', ie VERY FEW EXIST. 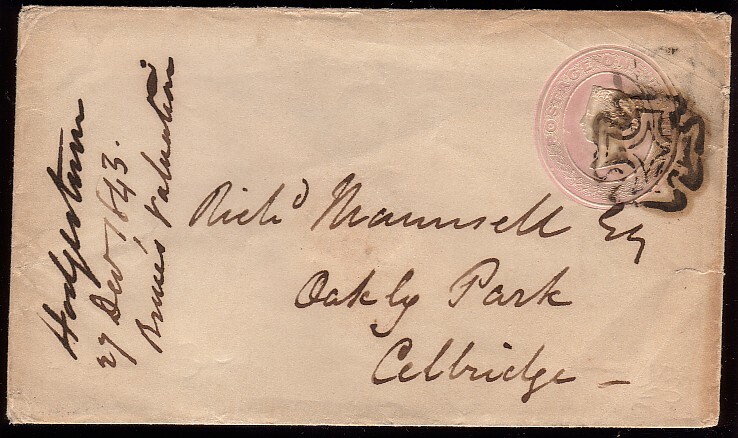 A remarkable item and likely to be unique in having the largest number extant of this rare strike on a single envelope. 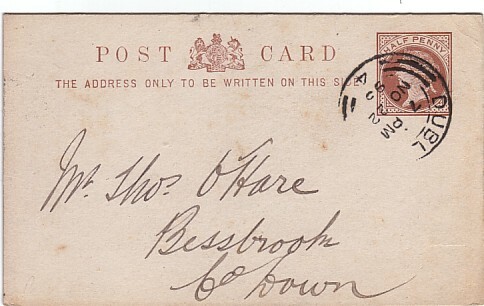 151212: Superb halfpenny brown postcard sent from Dublin, November 22nd 1895 to Bessbrook Co Down. of the edges is caused by the scanner. 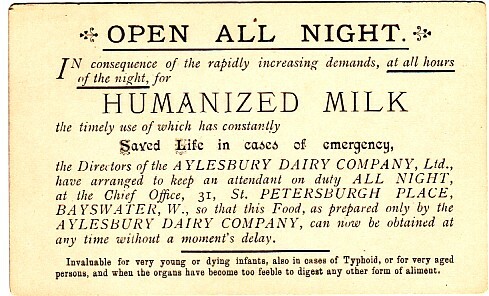 on the reverse for Humanized Milk prepared and sold only by the Aylesbury Dairy Company. On the internet are details of the inventor. Scarce item in such fine condition. the difference is caused by the scanner. and cancelled by a fine characteristic LIMERICK CROSS. example is close to the latest recorded usage of this distinctive cross. and is clearly much scarcer on a 1d pink envelope. 15200. 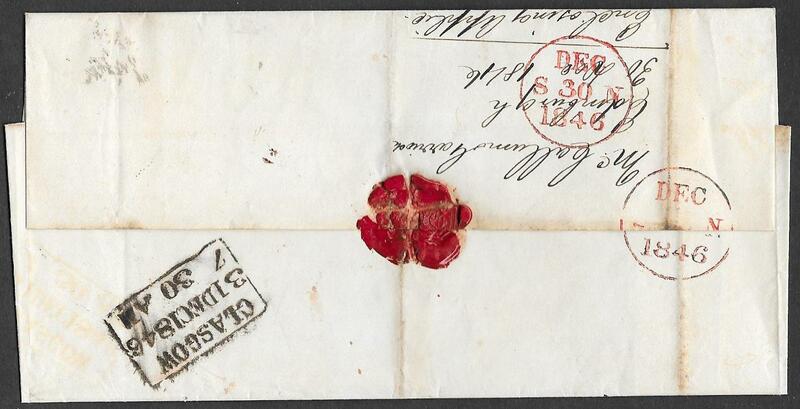 Fine 1d pink envelope from Kelso to Edinburgh, December 30th 1842. Cancelled by a fine strike, with usual partial debris-filling, of the characteristic KELSO CROSS. Rockoff records only ONE OTHER 1d pink envelope with this cross and that for November 8th 1842. Priced by Gibbons in the latest, 2011, QV Volume 1 at £4,000 on a 1d red on cover. to Audlem Cheshire, April 29th 1841, LEAMINGTON characteristic cross. in the latest, 2011, QV Volume 1, at £800 on cover with a 1d red. Overall fine condition and a fine strike of this cross. and rarely found so fine on a stationery envelope. and enclosed with the books. Very unusual and economical with paper! for their Fishing Reels and Flies. SG197 1/2d vermilion, tied by Perth cds for December 14th 1897. Some age browning at the right edge though much fainter than the scan suggests. 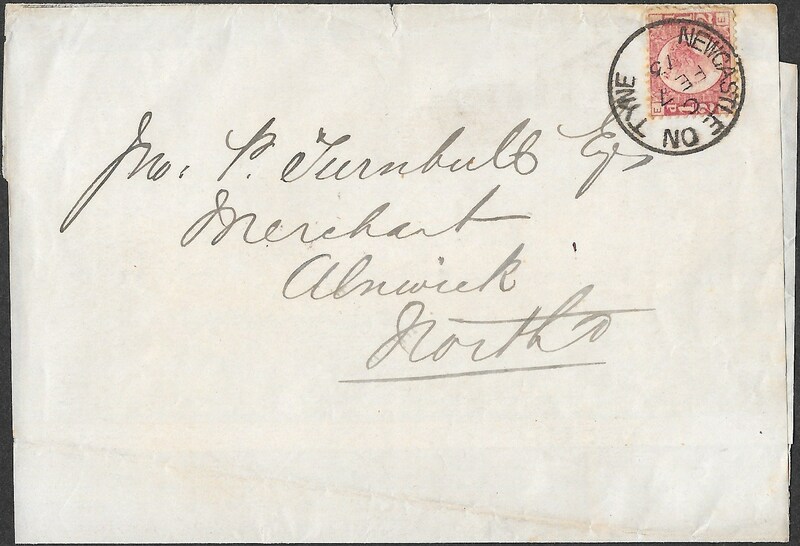 Only the second example we have seen of this attractive envelope – the last was in 2004! Wrapper with a rare illustrated Advert. London to Paris, with NPB cancellation in very fine condition. 100 Queen Victoria St, London E C.
Postcard sent from Stratford to Chicago, August 18 1900, with a Shakespeare 1/- label in brown-red. These labels were to raise monies for the Church restoration and were to be used with ‘official’ stamps to pay the postage. postage being added and is rare as such. The message on the back is interesting in itself – see scan. label being changed in some years. The 1/- ochre was used in later years, possibly as late as 1911. A rare and attractive grouping.